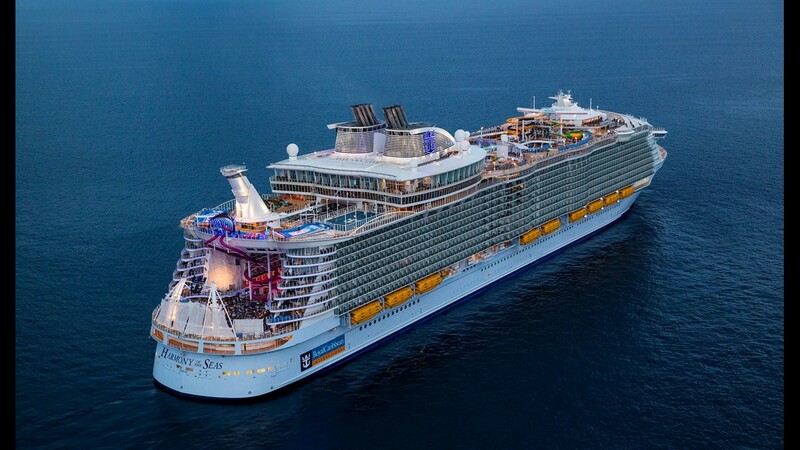 At 228,081 gross register tons, Royal Caribbean's Symphony of the Seas is the largest cruise ship ever built. Among the most notable features on the top deck of Symphony of the Seas is Perfect Storm -- a massive water slide complex. 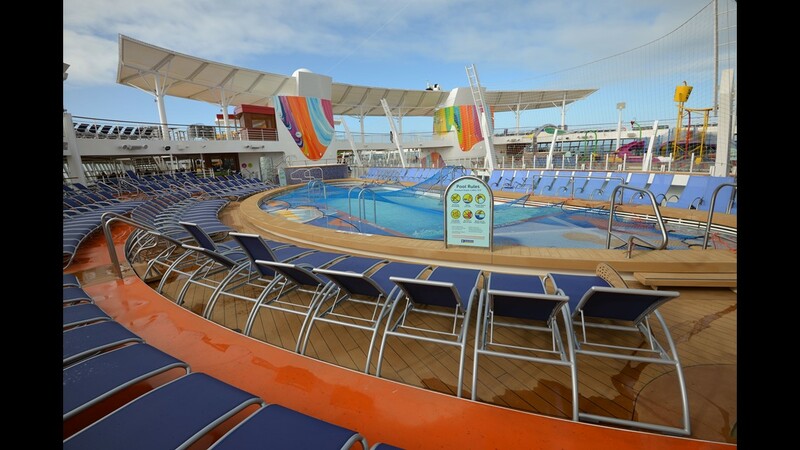 Symphony has three large pool areas on its top deck, one of which is called the Sports Pool. 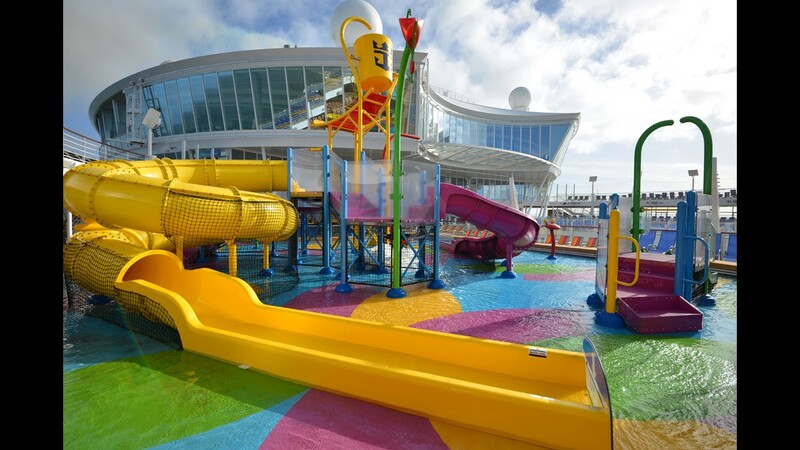 Symphony is home to one of Royal Caribbean's largest-ever kiddie aqua parks, Splashaway Bay. It offers slides, water cannons and waterfalls as well as a dump bucket. Splashaway Bay is one of four watery fun zones on Symphony of the Seas' top deck. A hot tub awaits passengers at the Main Pool area atop Symphony of the Seas. 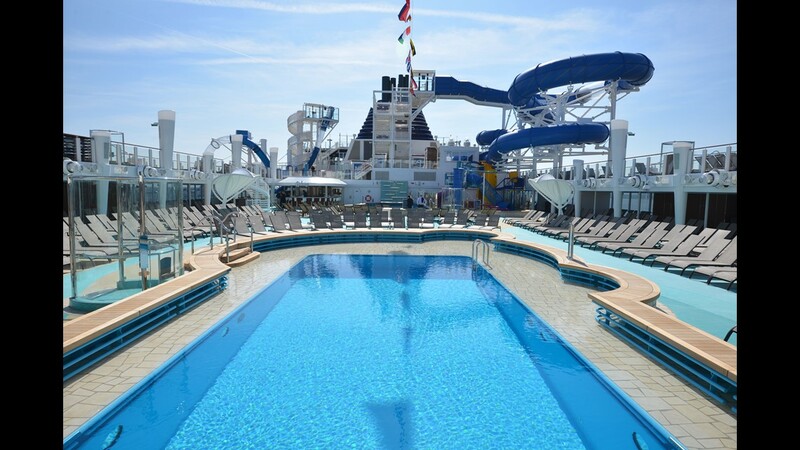 It's one of three distinct pool areas on the top of the vessel. 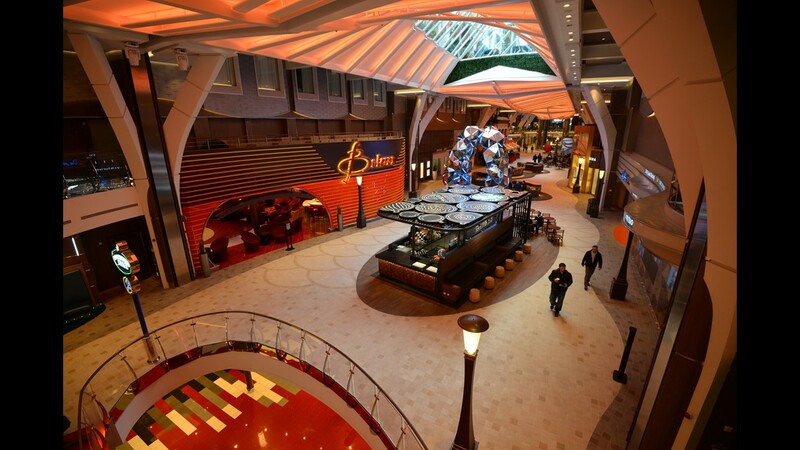 Among the notable features on Symphony of the Seas is Central Park, an tree-lined area of eateries, bars and shops that runs down the center of the ship. 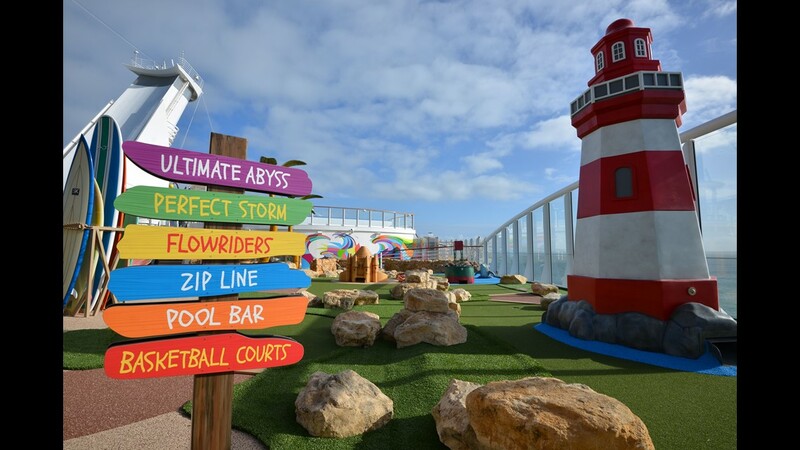 A miniature golf course is located at the back of Symphony of the Seas. Adirondack-style chairs painted blue and offer passengers a place to lounge between rounds of miniature golf. 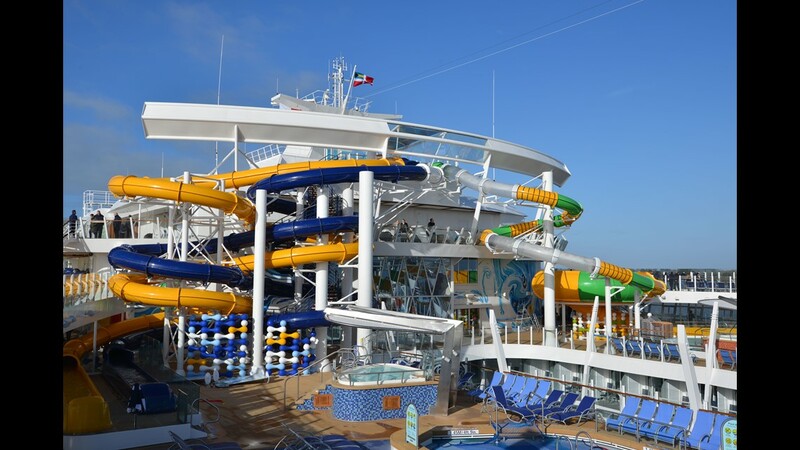 Like sister ship Harmony of the Seas, Symphony of the Seas is home to a nine-deck-high slide called Ultimate Abyss. 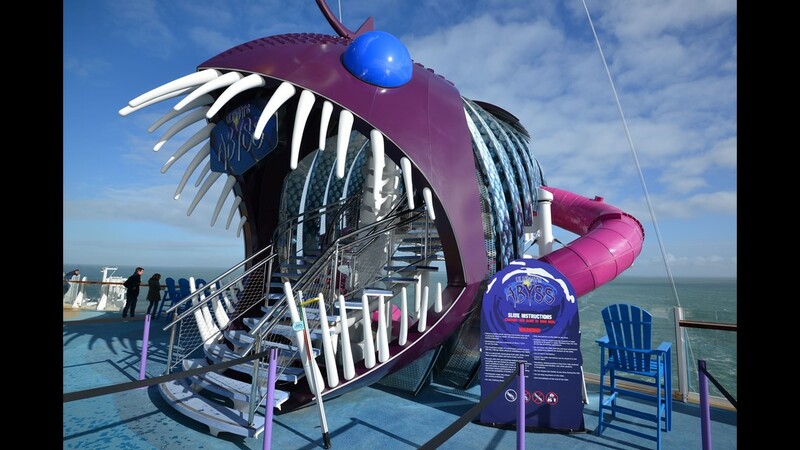 Passengers enter through the giant jaws of an angler fish. Like Royal Caribbean's three other Oasis Class ships, Symphony of the Seas has two FlowRider surfing simulators. They're part of an outdoor area called The Pool and Sports Zone. 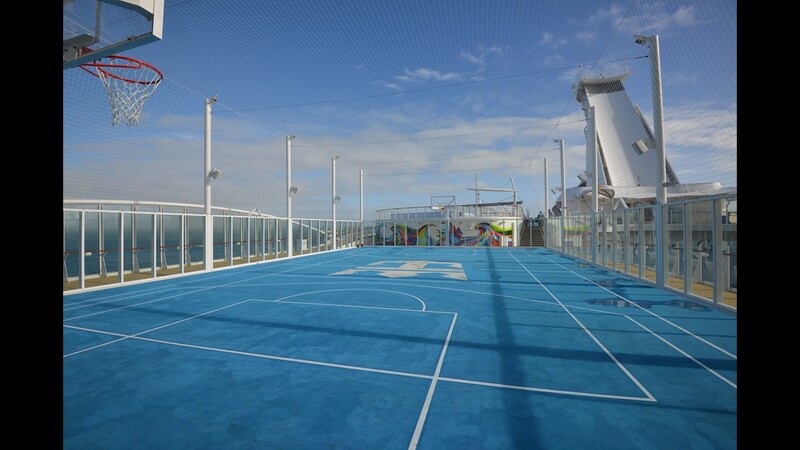 The Pool and Sports Zone at the back of Symphony of the Seas also features a basketball court. Like other Royal Caribbean ships, Symphony of the Seas features a car along its Royal Promenade. But in this case, it's a sculpture created from a car. Called Beetle Sphere, it's by artist Ichwan Noor and was created using original parts from a 1953 Volkswagon Beetle. 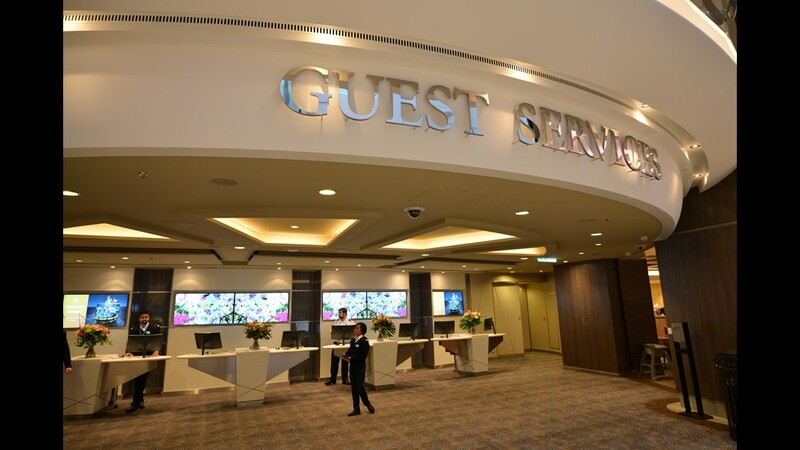 The Royal Promenade also is home to a Next Cruise office where passengers can research and book future sailings. 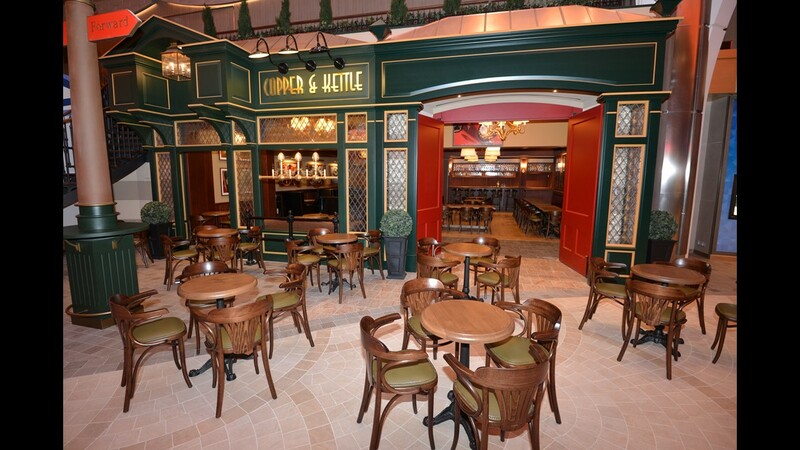 As is the case on other Royal Caribbean ships, Symphony of the Seas' Royal Promenade is home to a British-style pub. On Symphony, it's called Copper & Kettle. The Copper & Kettle serves up a wide range of beers and offers live music nightly. 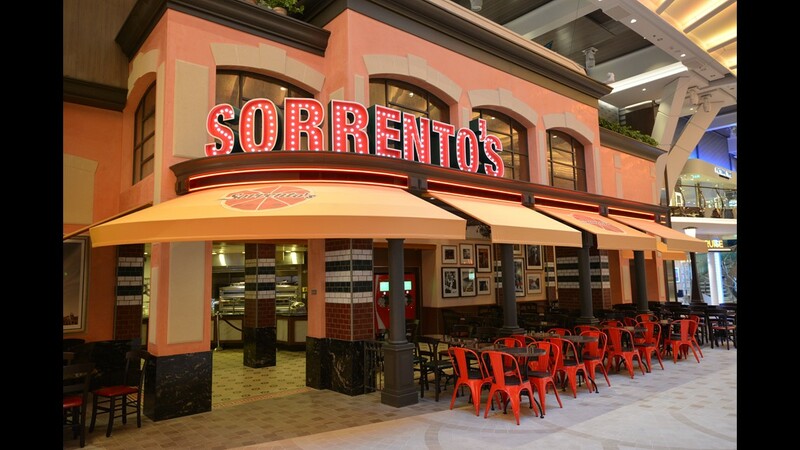 Across from Copper & Kettle is Sorrento's, a quick-bite Italian eatery with pizza and more. Port Merchants is one of several shops along the Royal Promenade. Also located on the Royal Promenade, Boleros is a Latin-themed bar and lounge that serves up Latin-inspired drinks like mojitos and caipirinha. 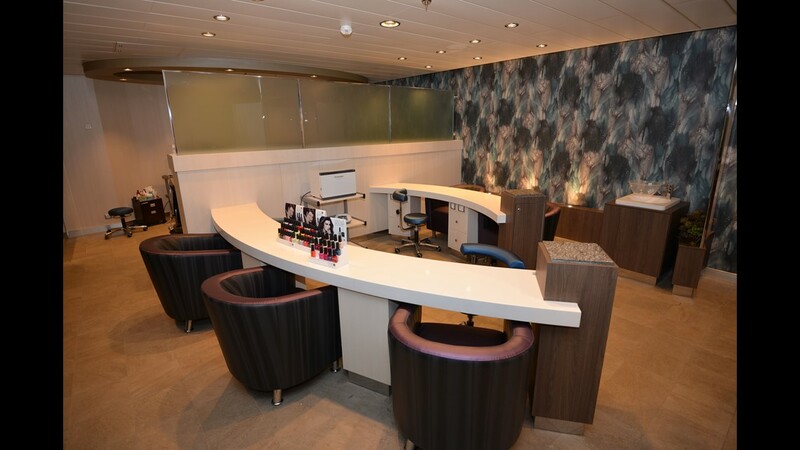 Nail stations in the salon at the Vitality at Sea spa. 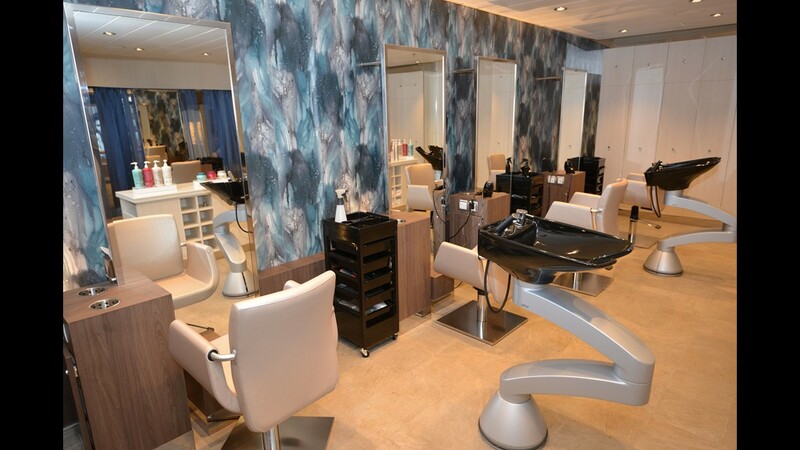 Hair stations in the salon at the Vitality at Sea spa. 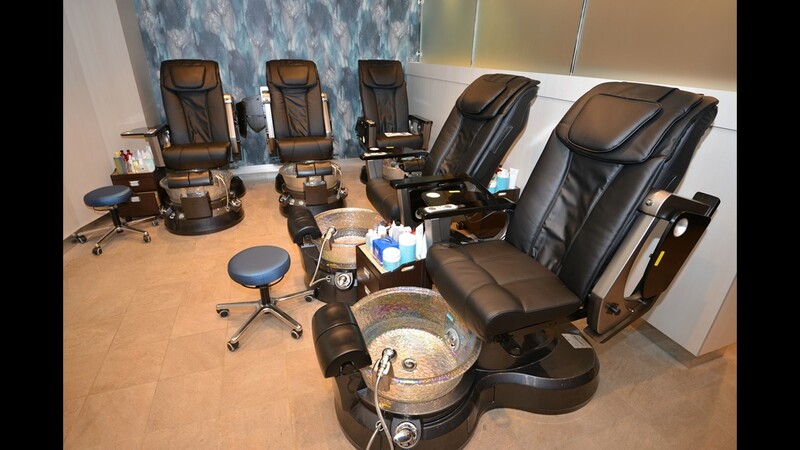 Pedicure stations in the salon at the Vitality at Sea spa. 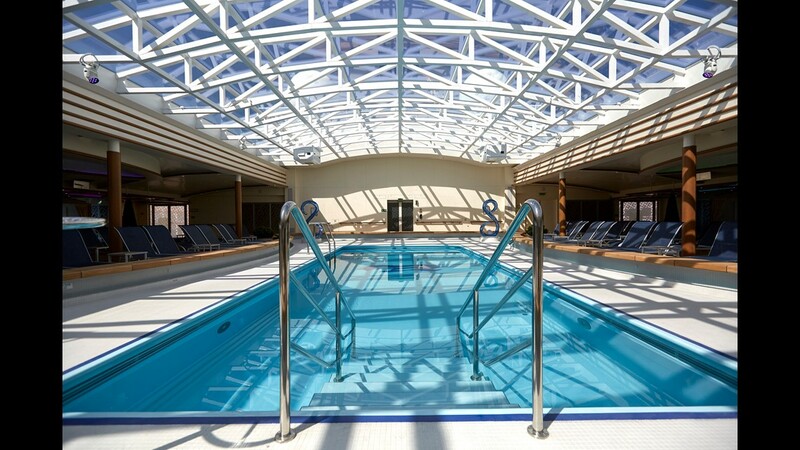 Symphony's spa and fitness center, dubbed Vitality at Sea, is one of the largest ever on a cruise ship. 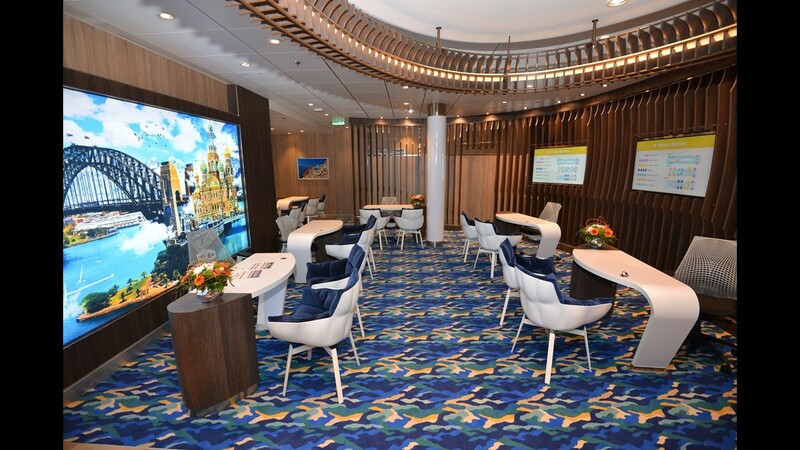 A cozy waiting area awaits spagoers at Symphony of the Seas' Vitality at Sea spa. 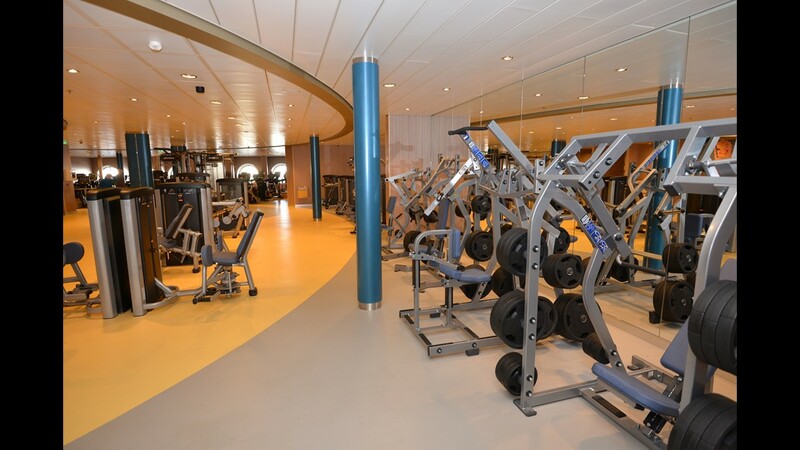 Life Fitness equipment fills the Vitality at Sea fitness center. 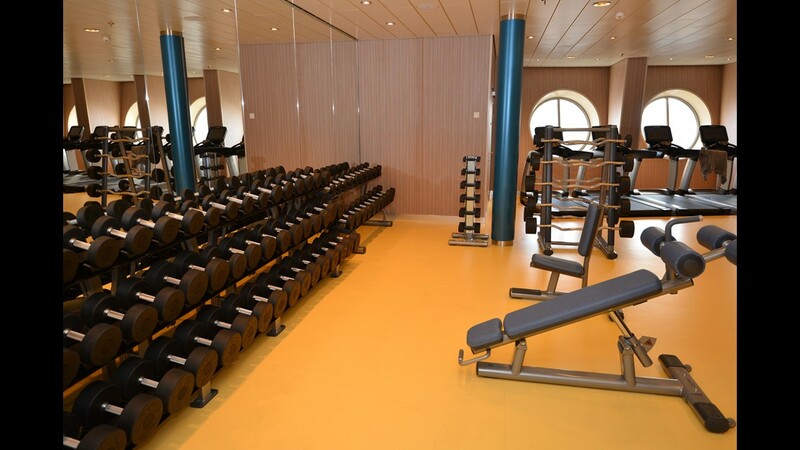 The Vitality at Sea fitness center also has a wide range of free weights. 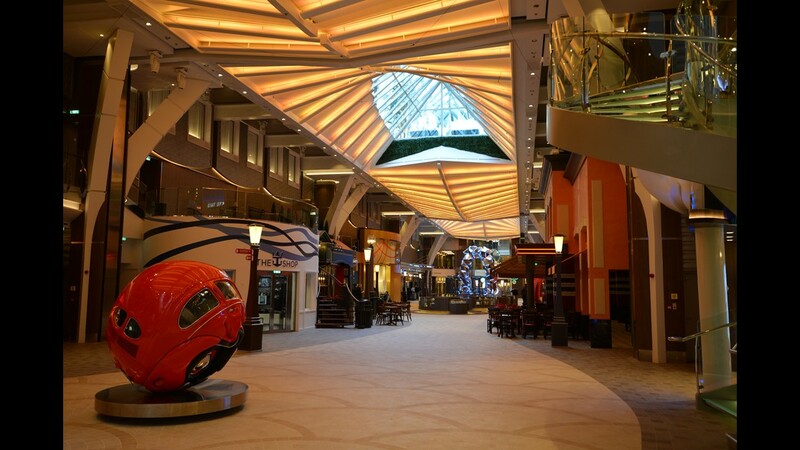 Located on Deck 5 of Symphony of the Seas is Royal Promenade, an indoor, mall-like space filled with eateries, bars and shops. The bar at the On Air Club. Among the venues on Royal Promenade is the On Air Club. 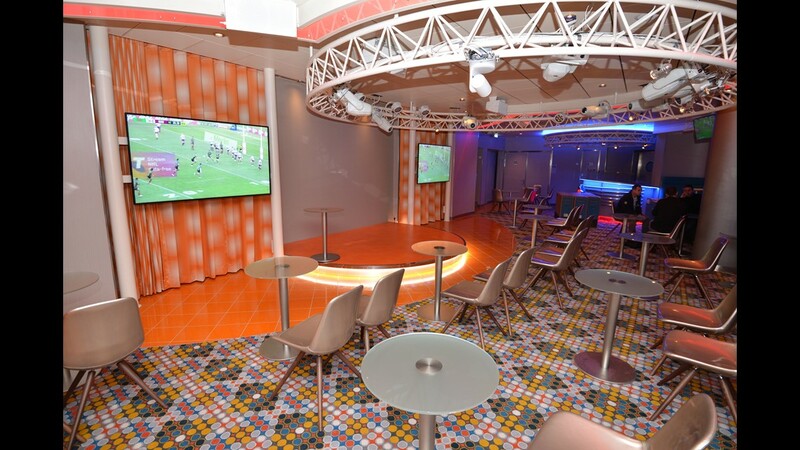 The On Air Club features a small stage and screens that show sporting events. 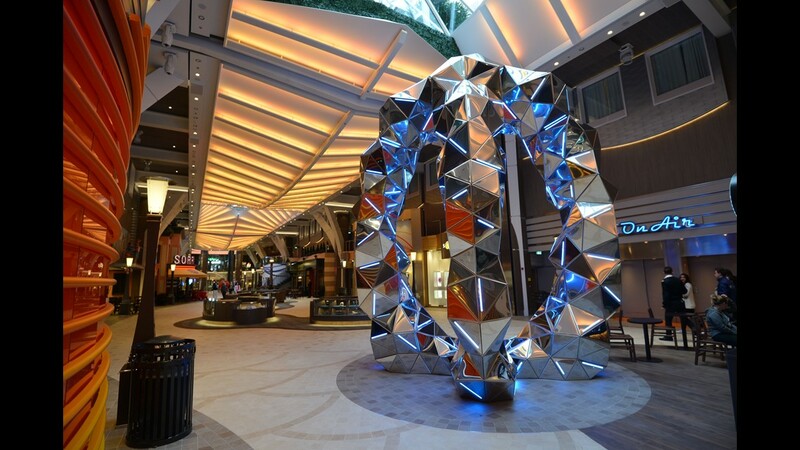 The Royal Promenade on Symphony of the Seas features a massive, 18-foot-high metallic sculpture by artist Gregor Kregar. Called Paradox Void, it was created by 1,200 laser-cut mirrored stainless steel triangles and 200 sections of LED lights, and it weighs three tons. Symphony of the Seas features a Starbucks along its Royal Promenade. 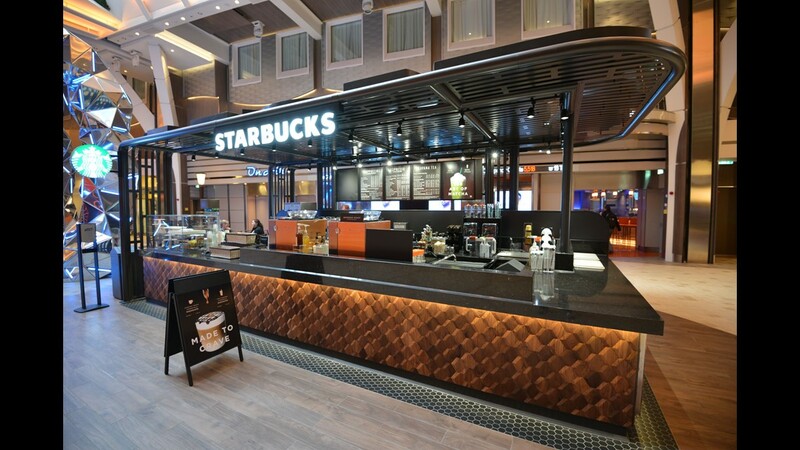 Royal Caribbean was the first cruise line to feature Starbucks on ships. 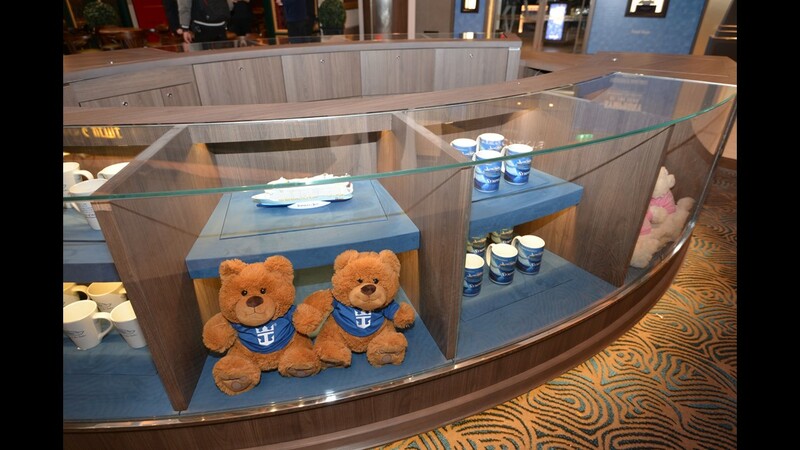 Royal Caribbean logo items are for sale from kiosks along the Royal Promenade. 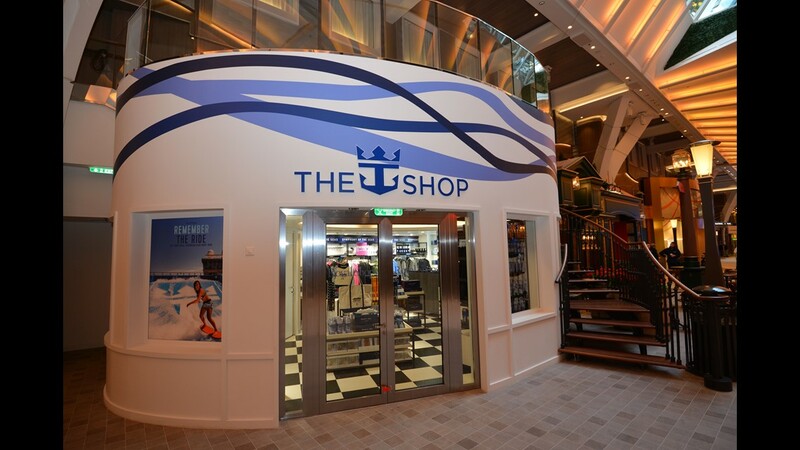 The Shop, selling Royal Caribbean logo wear, takes the place of the Kate Spade shop that is located on Symphony of the Seas sister ship Harmony of the Seas. 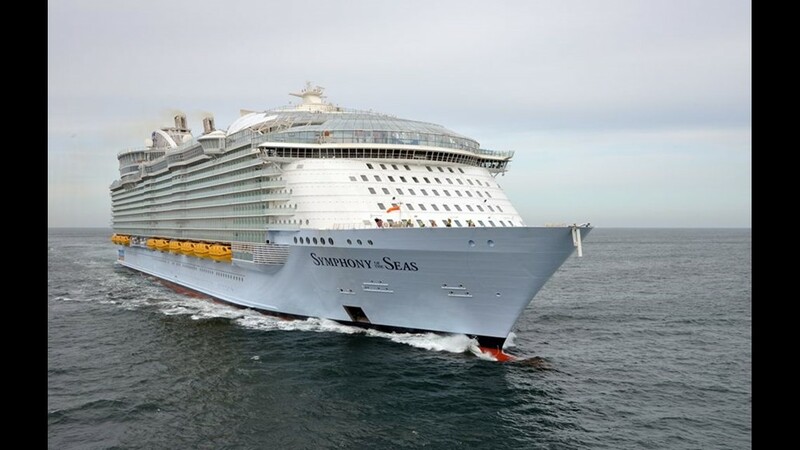 Like other Oasis Class ships, Symphony of the Seas features a Rising Tide that rises between the Royal Promenade on Deck 5 and the Central Park area on Deck 8. 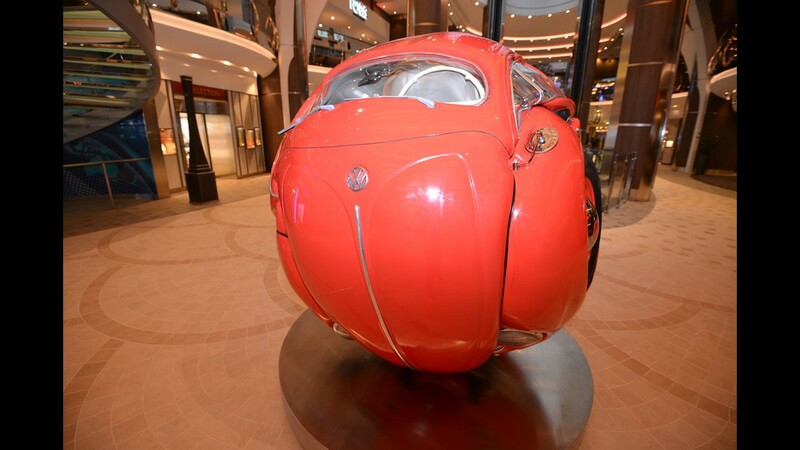 The Beetle Sphere sculpture is located just in front of the Promenade Cafe along the Royal Promenade. 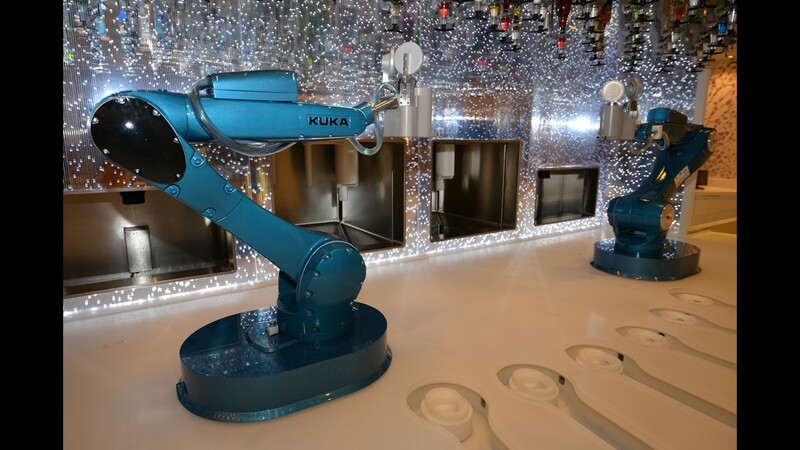 Symphony features a Bionic Bar where a robot bartender serves the drinks, a concept that made its debut in 2014 on Royal Caribbean's Quantum of the Seas. 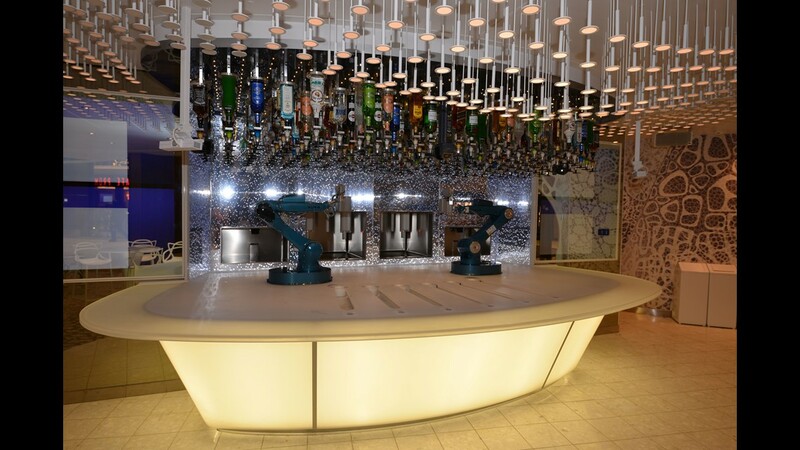 Two robotic arms sit at the ready to mix drinks at Symphony of the Seas' Bionic Bar. 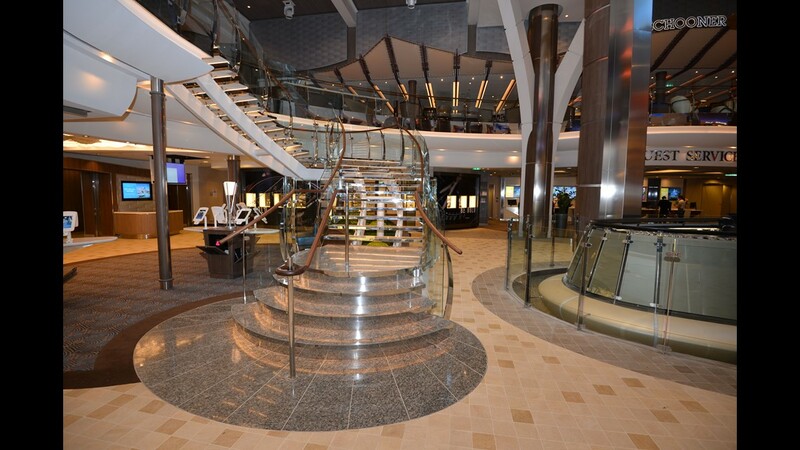 An elegant stairway on one end of the Royal Promenade leads up to the Schooner Bar on Deck 6. 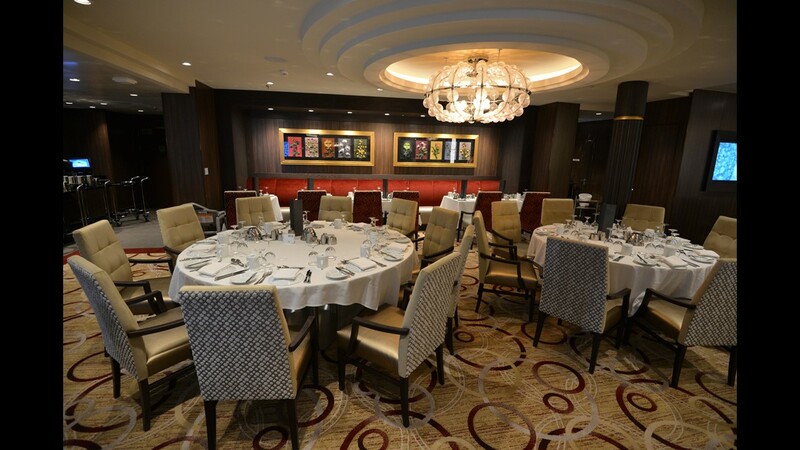 The three-deck-high main dining room on Symphony of the Seas features different decor on each level. 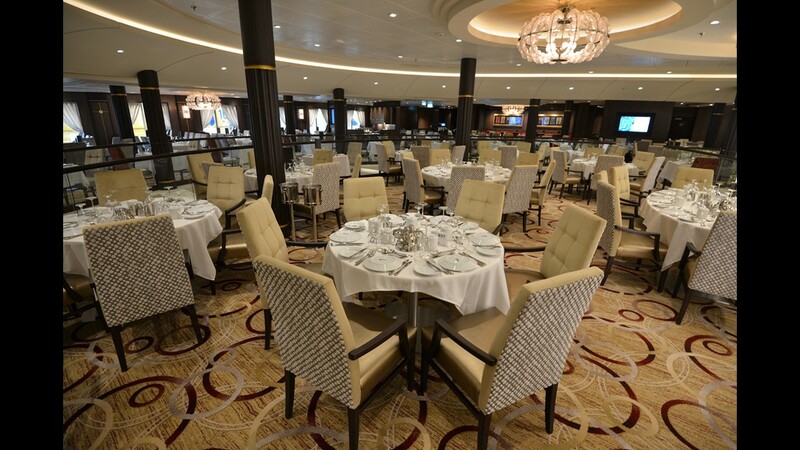 A seating area on the top level of Symphony of the Seas' main dining room. 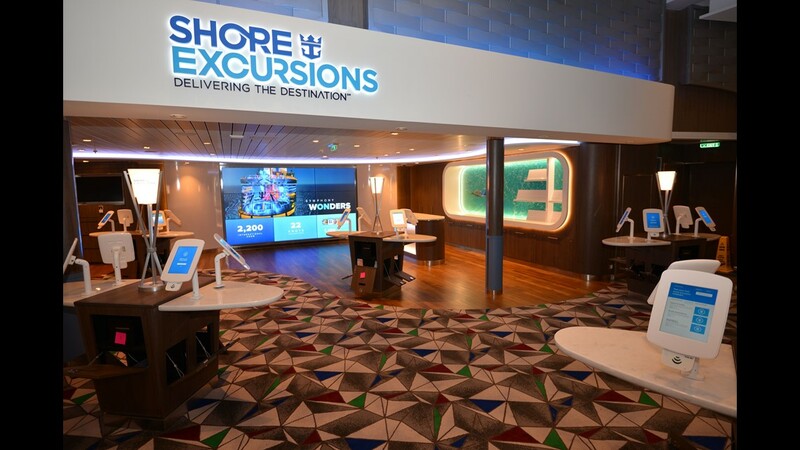 A shore excursions desk on Deck 5 features interactive screens where passengers can book tours off the ship. The Schooner Bar is a popular gathering point for passengers in the evenings. 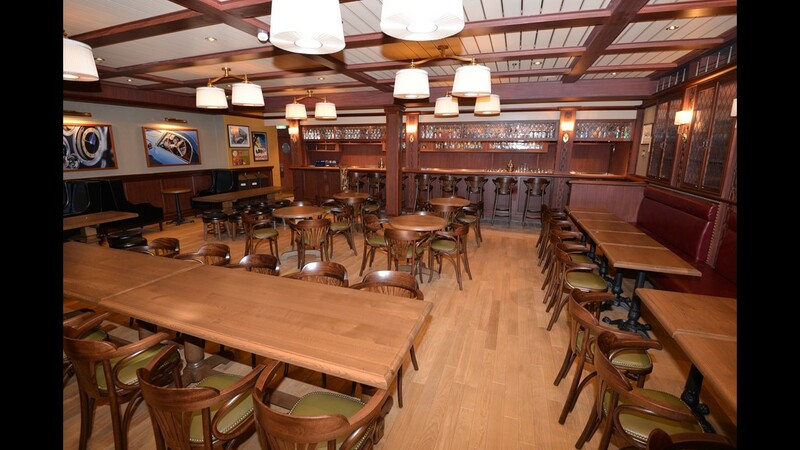 The nautically-themed Schooner Bar, an icon of Royal Caribbean ships, is located on Deck 6 overlooking the Royal Promenade. Passengers on a Baltimore-based cruise ship are getting their vacations extended by three days thanks to Hurricane Florence. 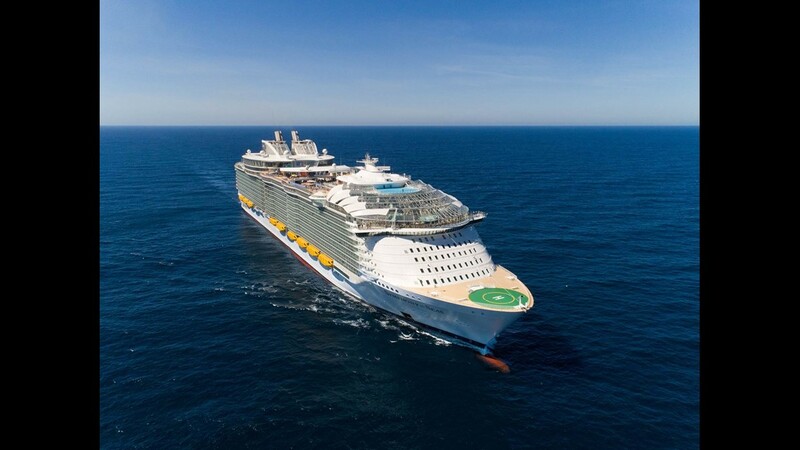 In a Thursday afternoon tweet, Royal Caribbean chief meteorologist James Van Fleet said the line's Grandeur of the Seas won't return to Baltimore until late Sunday — more than three days behind schedule — as it steers clear of the storm. The 2,446-passenger ship had been due back in the city early Thursday. Grandeur has spent the last two days hiding out from the storm in Port Canaveral, Florida, more than 800 miles south of Baltimore. The delayed return to Baltimore is just the latest change for passengers on Grandeur. The ship initially was scheduled to cruise to Bermuda this week but switched its destination to the Bahamas and Florida as Florence approached. 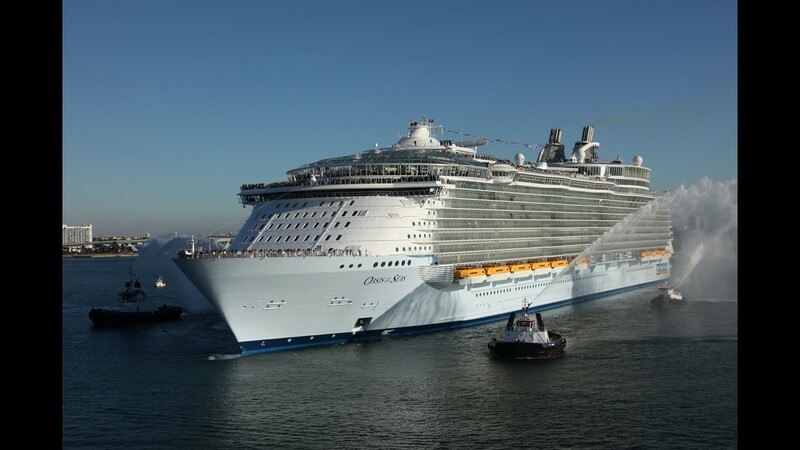 As a result of Grandeur's delayed return to Baltimore, Royal Caribbean has delayed a subsequent sailing of the ship that had been scheduled to begin Thursday. The nine-day trip to Canada and New England won't begin until Monday and has been shortened by four days. The vessel now only will make one stop, in Halifax, Nova Scotia. Passengers can cancel the trip for a refund in the form of a credit for a future cruise. Grandeur is just one of more than half a dozen cruise ships based along the East Coast that have been affected by Florence. Several Carnival Cruise Line and Norwegian Cruise Line ships scheduled to sail to Bermuda this week from such cities as Boston and New York have had to reroute to Canada or the Bahamas. In addition, the storm has forced the closure of the Port of Charleston, S.C., where Carnival's 2,056-passenger Carnival Ecstasy is scheduled to disembark and embark passengers on Sunday. In a statement sent to USA TODAY, Carnival said it planned to go ahead with the operation but was monitoring the storm closely in coordination with the port. "As of now, our plan is to operate the sailing on Sunday, assuming the post-storm assessments have been completed by the local authorities and the port has re-opened to inbound traffic," Carnival said. "We strongly encourage our guests to focus on their safety and security." Carnival said passengers on Sunday's departure of Carnival Ecstasy from Charleston should sign up for text alerts by texting CCL2 to 278473. 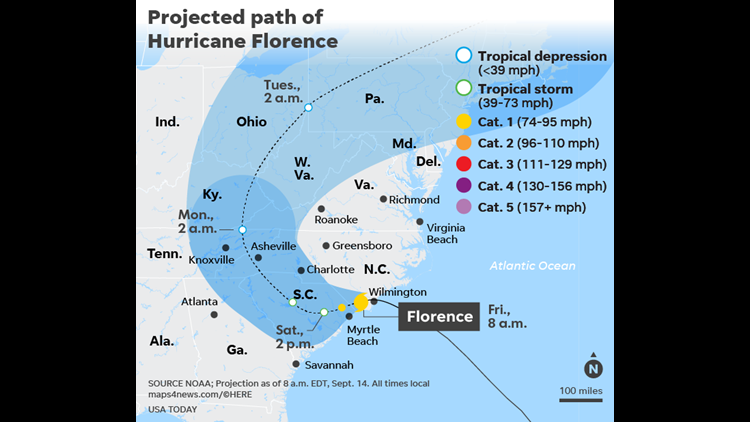 As of 8:00 AM ET Friday, Florence was centered about 10 miles south of Wilmington, North Carolina after making landfall at Wrightsville Beach, North Carolina. The hurricane had maximum sustained winds of 90 miles per hour. 1. Royal Caribbean's Symphony of the Seas. Unveiled in March 2018, the 18-deck-high vessel measures 228,081 tons and can carry up to 6,680 passengers at full capacity. The Ultimate Family Suite on Royal Caribbean's Symphony of the Seas features two bedrooms and is chock full of fun zones. 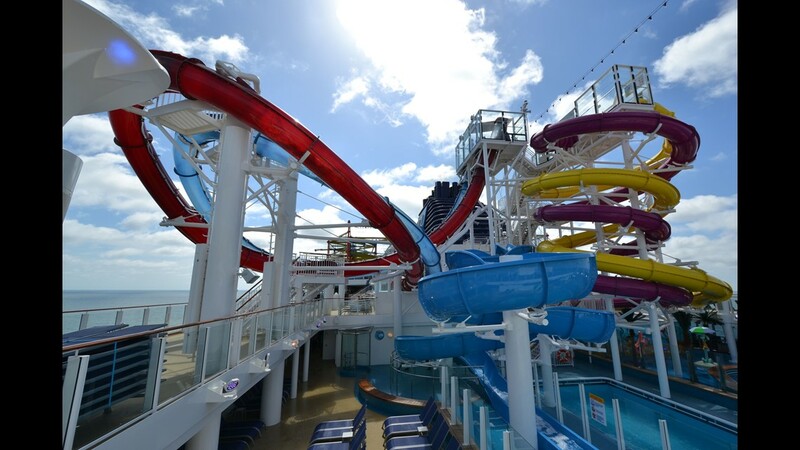 Among amusements, Symphony features the tallest slide at sea, called Ultimate Abyss. 2. Royal Caribbean's Harmony of the Seas. Unveiled in 2016, Harmony is just a tad smaller than Symphony of the Seas at 226,963 tons. 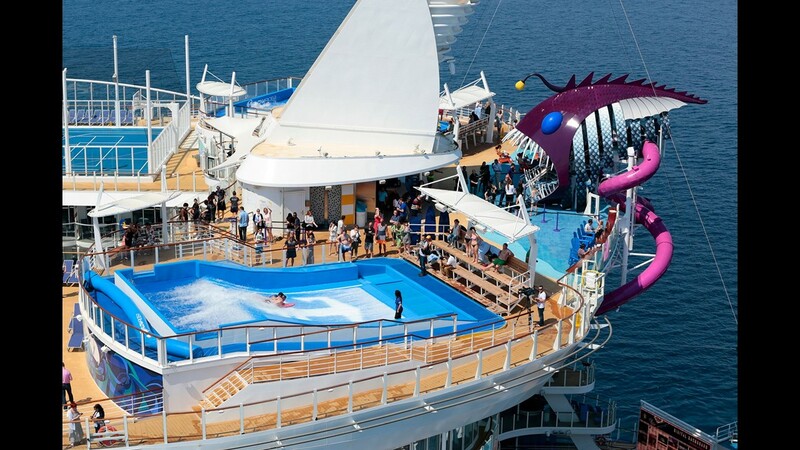 Like Symphony of the Seas, Harmony features a giant water slide complex on its top deck along with multiple pool areas. Royal Caribbean's Harmony of the Seas is the third of four vessels in the line's Oasis Class. 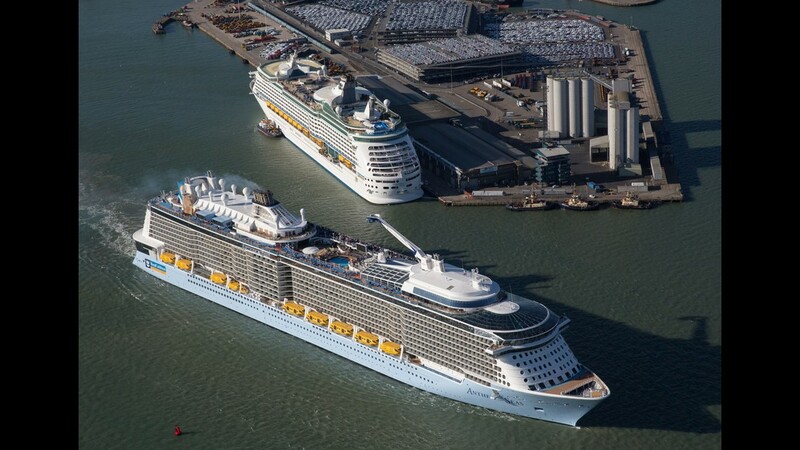 All four of the ships are more than 30% larger than the next largest cruise vessels. 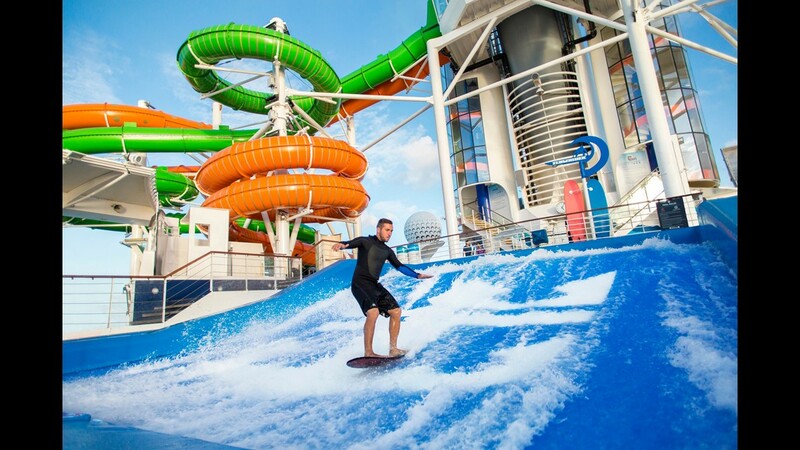 Top-deck amusements on Harmony of the Seas also include two FlowRider surfing pools. 3. 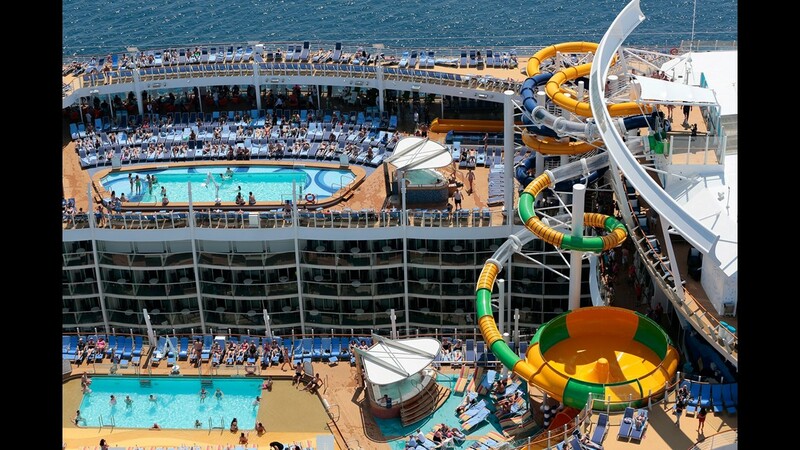 Royal Caribbean's Allure of the Seas. 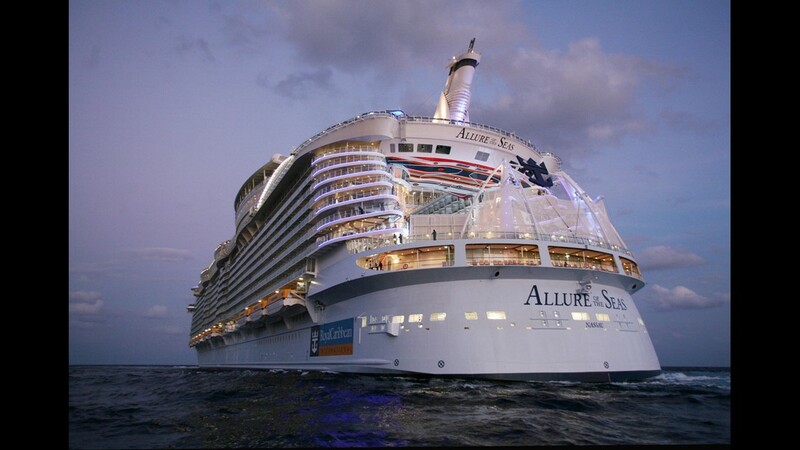 Unveiled in 2010, Allure is the second vessel in Royal Caribbean's Oasis Class and measures 225,282 tons. Notably, while Allure of the Seas is slightly smaller than Symphony of the Seas and Harmony of the Seas, it can hold more passengers. It's total capacity is 6,780. 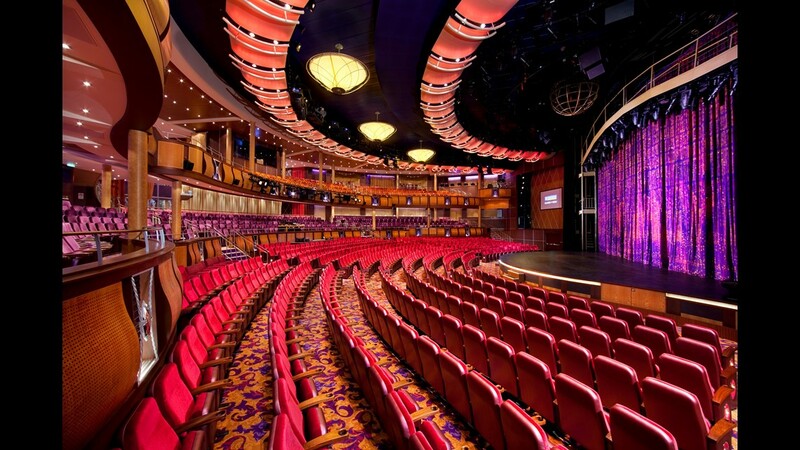 Allure of the Seas features one of the largest theaters at sea, capable of holding around 1,400 people. The massive size of Allure of the Seas and its Oasis Class siblings is evident when strolling through their interior public areas. 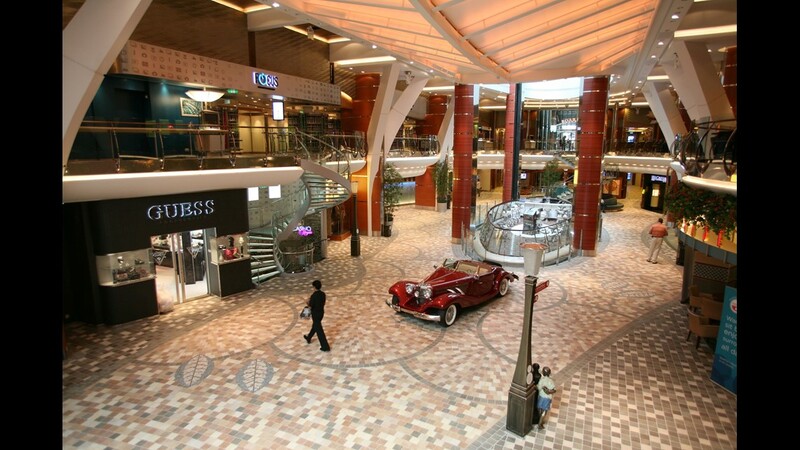 Each of the ships boasts a multi-deck mall-like area with shops, eateries and bars called the Royal Promenade. 4. 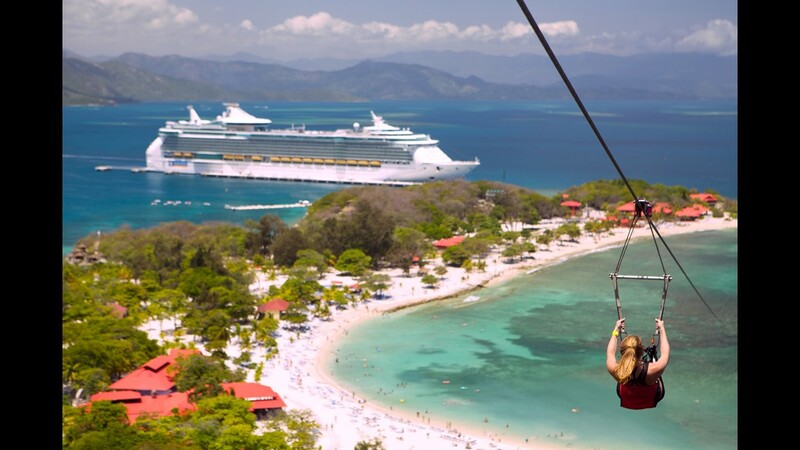 Royal Caribbean's Oasis of the Seas. Measuring 225,282 tons, Oasis was the world's largest ship when it debuted in 2009 but has been surpassed by its three later sisters. 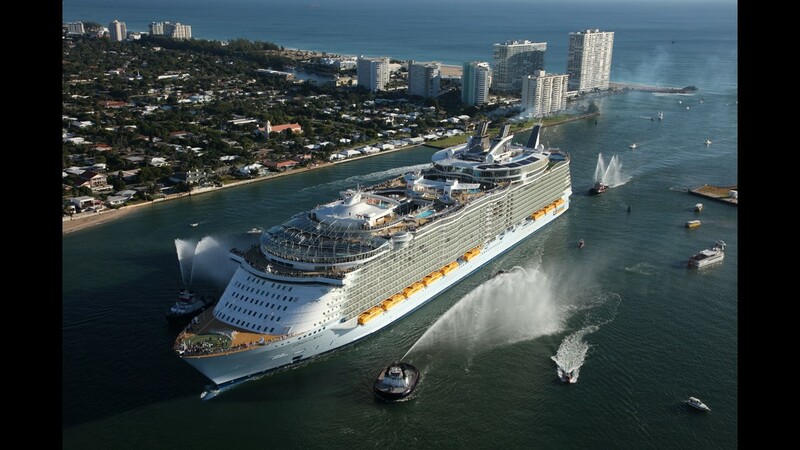 Oasis of the Seas is 1,187 feet long, putting it within two inches of its older sibling Allure of the Seas. 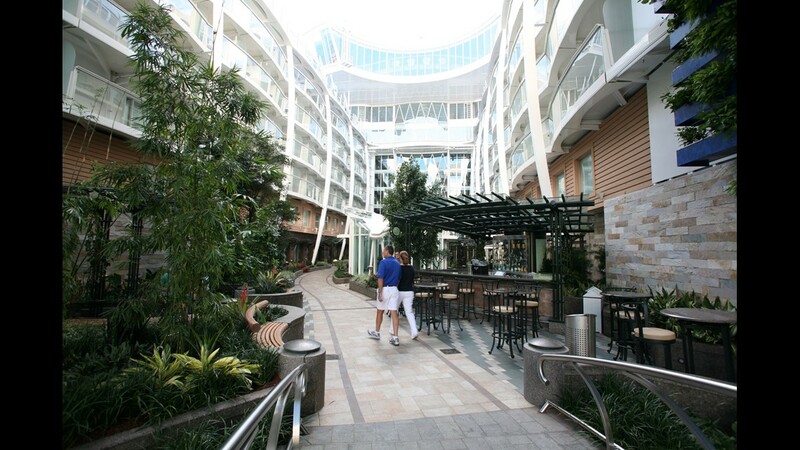 Like all of the Oasis Class ships, Oasis of the Seas features an open-air 'central park' with eateries, bars and shops that features more than 10,000 plants including trees. 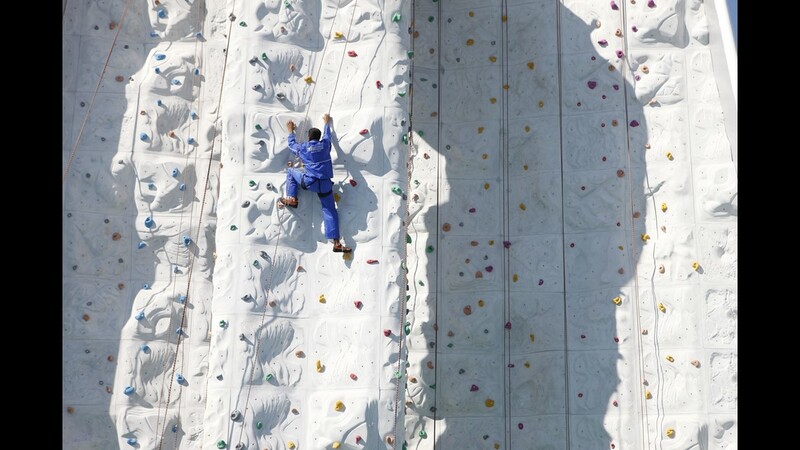 Oasis of the Seas has two large rock climbing rolls that overlook an an outdoor aqua theater. 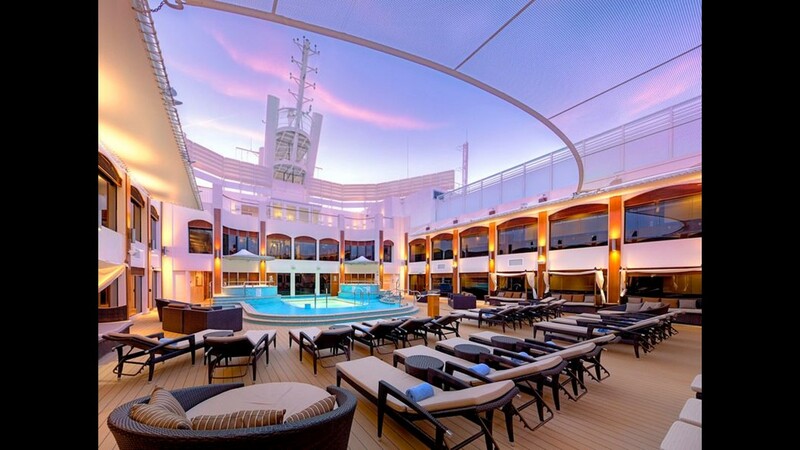 Another line that has been rolling out bigger and boxier ships in recent years is MSC Cruises. Here, MSC Cruises' new MSC Meraviglia, the fourth largest cruise ship in the world. 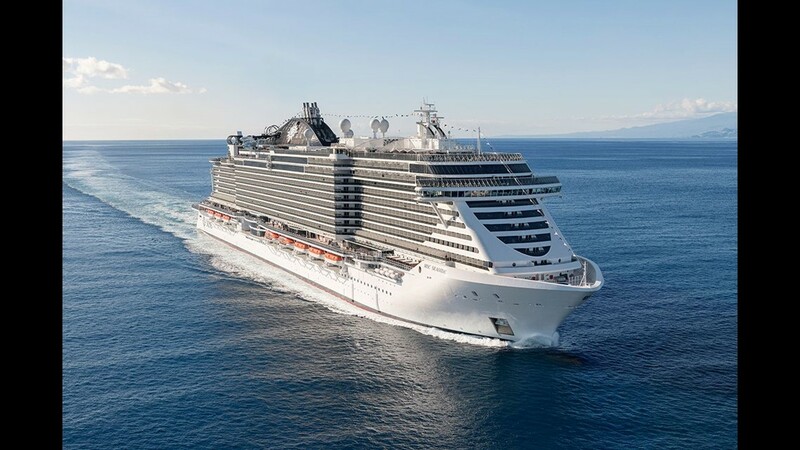 In contrast to the sculptural raked stern found on Crystal Symphony, newer ships such as MSC Cruises' MSC Meraviglia often have sterns that are almost completely squared off. The boxy design allows for more interior public space and cabins. The top deck of MSC Meraviglia as seen from near the front of the vessel on Deck 17. 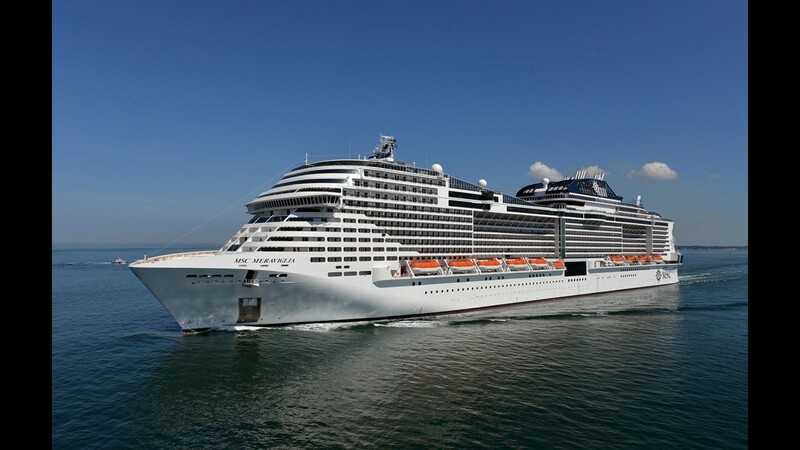 The boxy look of MSC Meraviglia is a result of the enormous amount of public space that it offers, including a massive water park area on its top deck. 6. 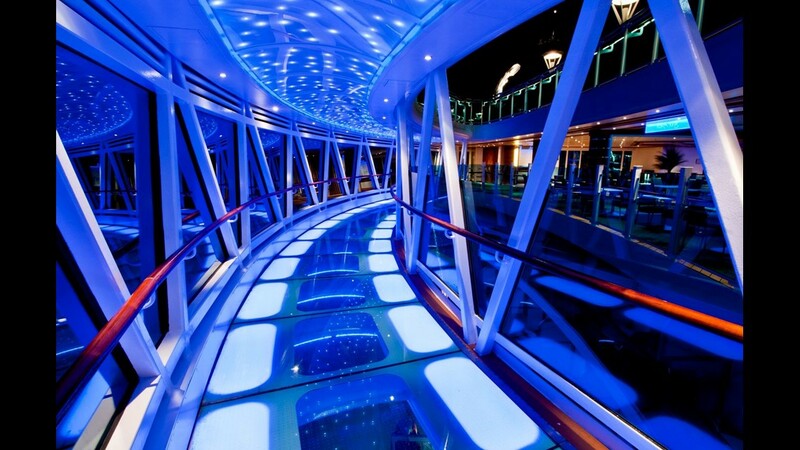 Royal Caribbean's Quantum of the Seas. 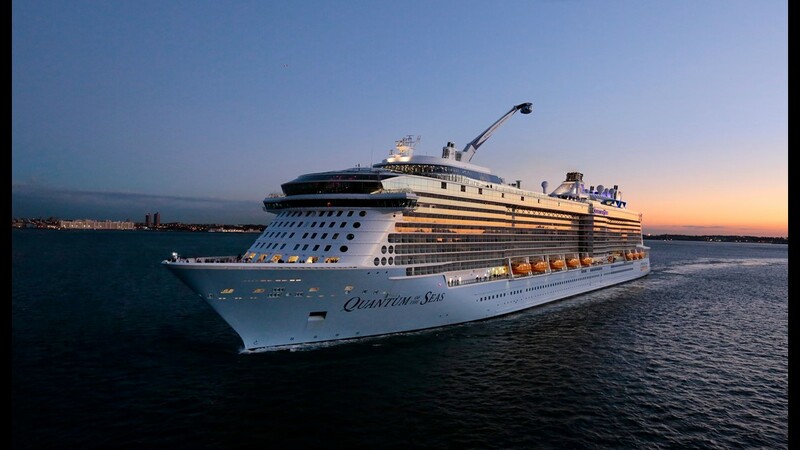 Unveiled in 2014, Quantum was the first of a new series of vessels at Royal Caribbean called the Quantum Class that measure 168,666 tons. 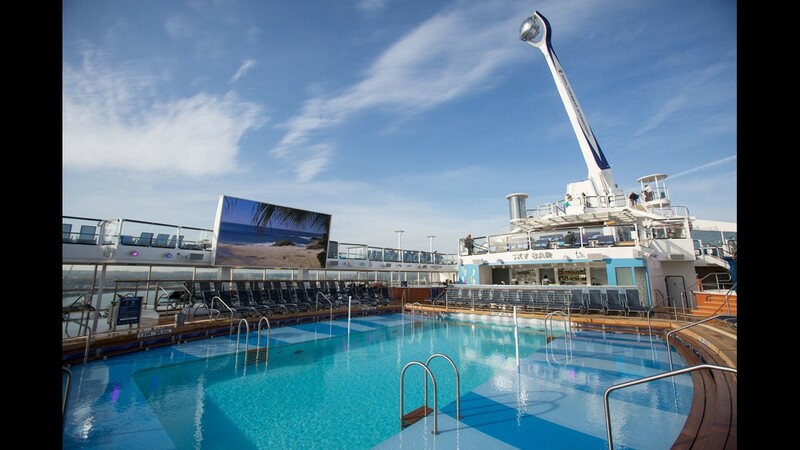 Among the most notable features of the Quantum Class is a mechanical arm with an observation pod that rises above the pool deck, offering passengers a bird's eye view. 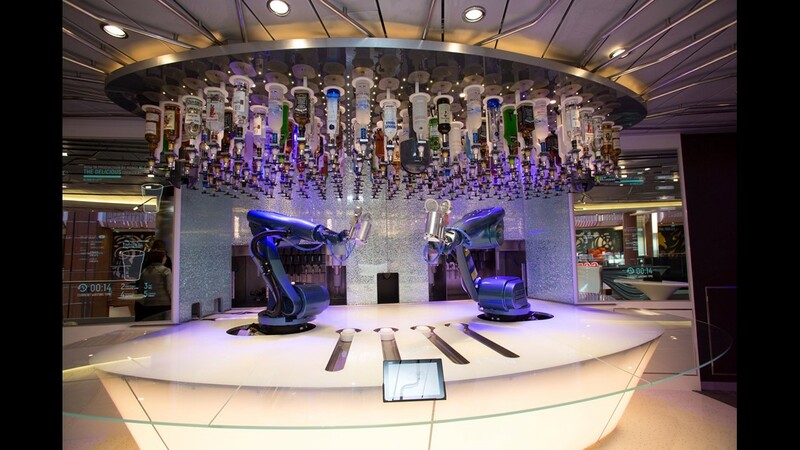 Quantum of the Seas was the first cruise ship with a 'bionic bar' featuring a robot bartender. It's a feature now on several Royal Caribbean ships. 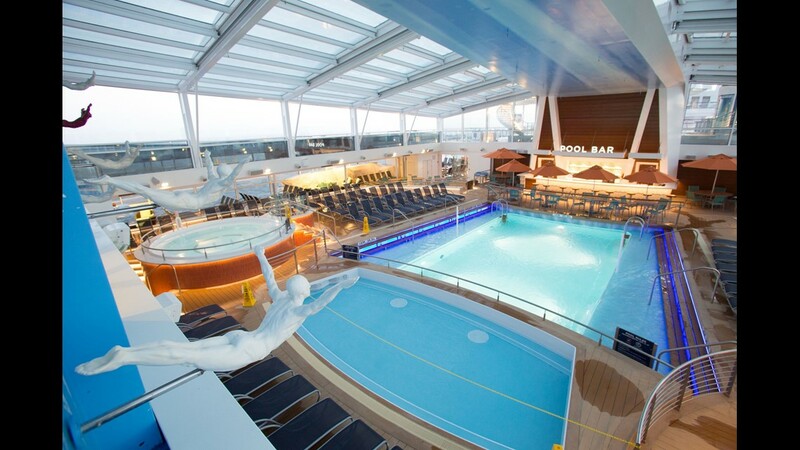 Designed to travel to parts of the world with inclement weather, Quantum of the Seas also is home to an expansive interior pool area. 7. 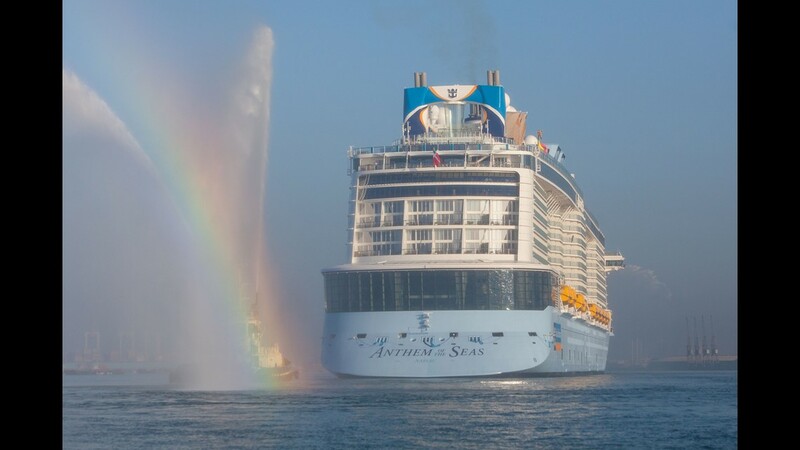 Royal Caribbean's Anthem of the Seas. 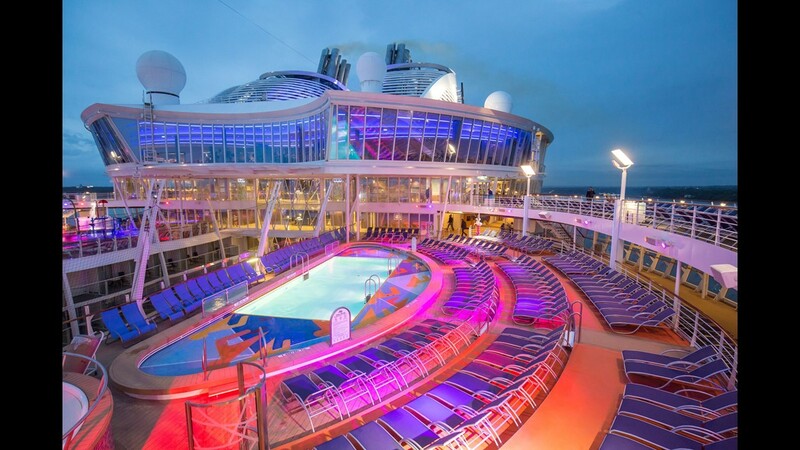 Unveiled in 2015, the second ship in Royal Caribbean's Quantum Class series measures 168,666 tons. 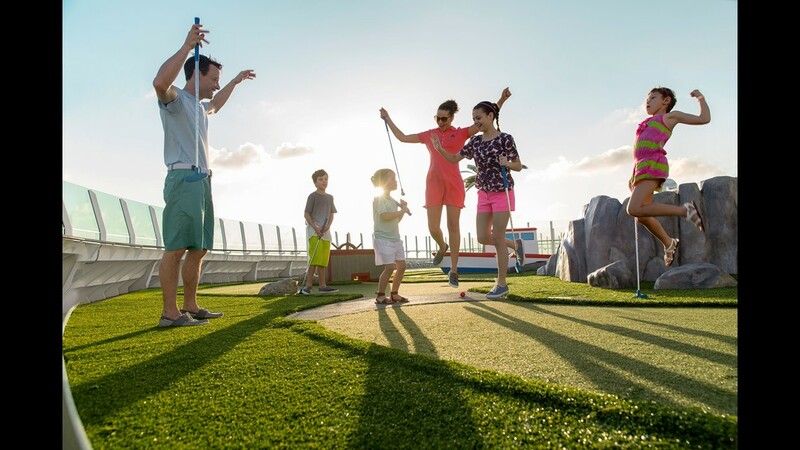 Like Quantum, Anthem of the Seas is packed full of gee-whiz attractions. 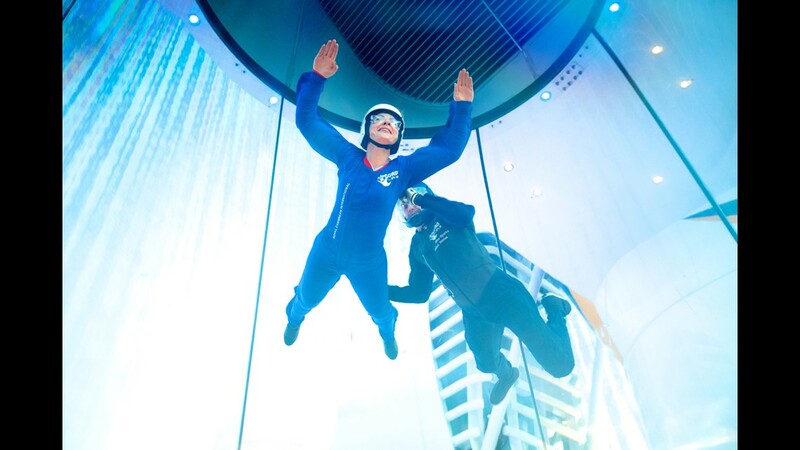 Among the notable attractions on Anthem of the Seas and its sister ships is a skydiving simulator. Royal Caribbean's Anthem of the Seas features some of the most elaborate suites at sea, including the two-deck-high, 1,640-square-foot Royal Loft Suite. 8. Royal Caribbean's Ovation of the Seas. Christened in 2016, Ovation is the third vessel in Royal Caribbean's Quantum Class and, like it's sisters, measure 168,666 tons. 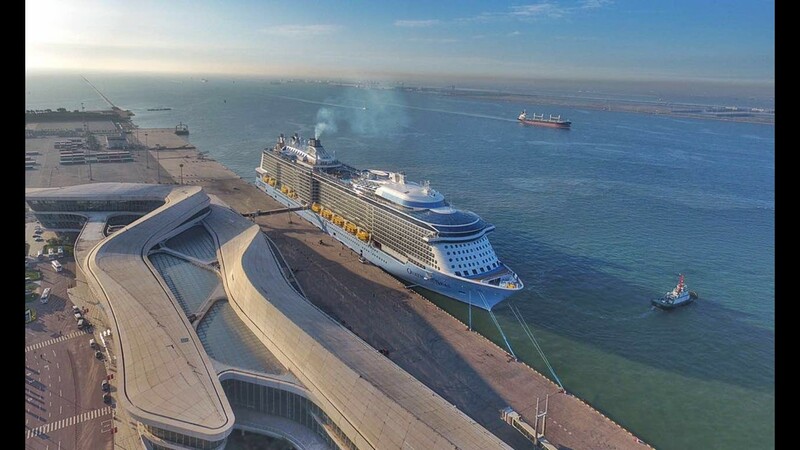 Ovation of the Seas initially has been dedicated to the Chinese market and based in Tianjin, China. 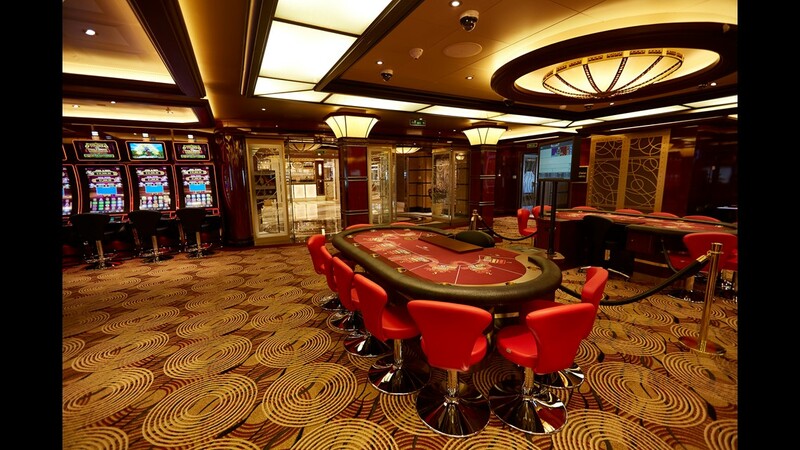 Ovation of the Seas features more casino areas than its Quantum Class sisters in a nod to the specific interests of Chinese travelers. 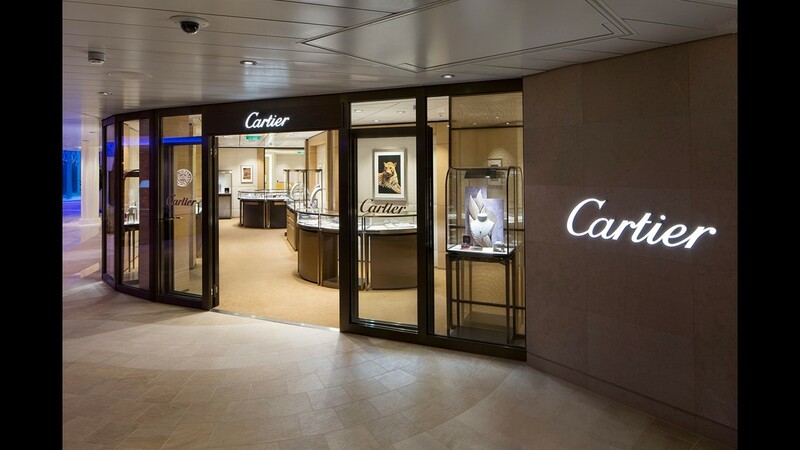 Ovation of the Seas also offers more shopping than other Quantum Class ships, including a Cartier store. 9. Norwegian Bliss. 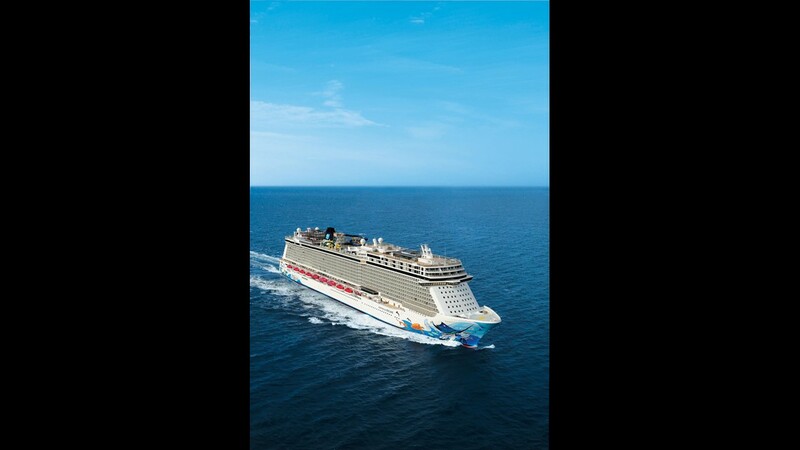 Unveiled in April 2018, Norwegian Cruise Line's largest ship ever measures 168.028 tons. 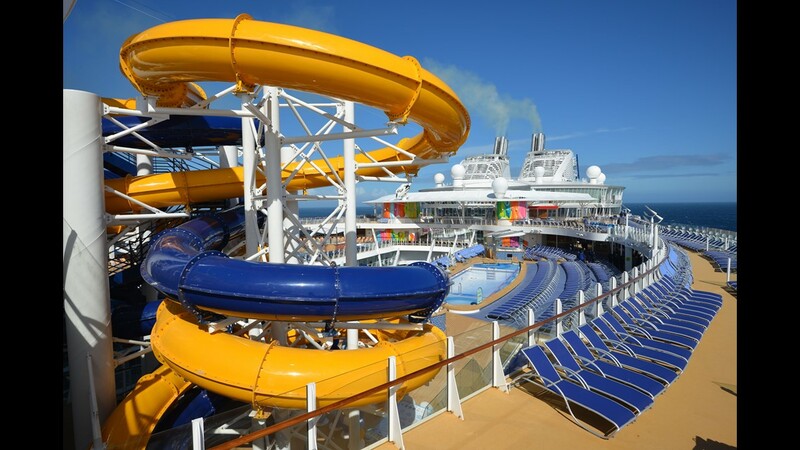 Twenty decks high and 1,082 feet long, Bliss is the third vessel in Norwegian Cruise Line's Breakaway Plus Class. The top of Norwegian Bliss is covered in fun zones including a main pool area with two large pools. Towering over the main pool deck are two giant water slides, including the swirling Aqua Racer (shown here). 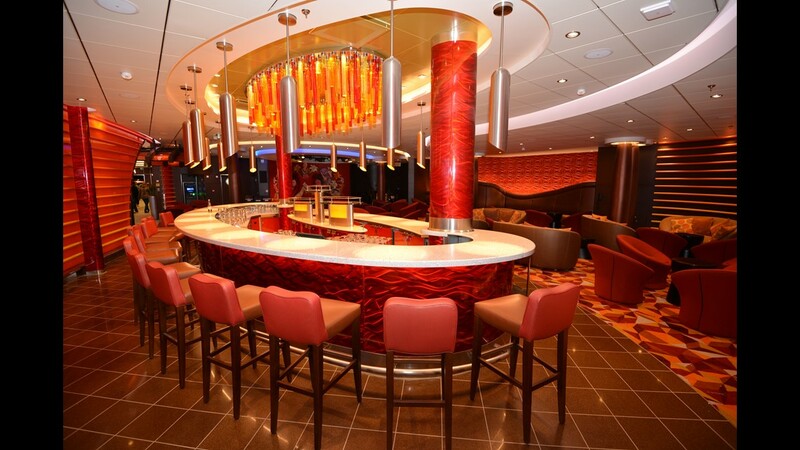 Norwegian Cruise Line's newest ship is the 3,883-passenger Norwegian Joy, which debuted in May 2017. The 167,725-ton vessel is the first at Norwegian custom designed for the Chinese market, and it sails in Asia. Norwegian Joy's deck-top area has a zen garden feel. 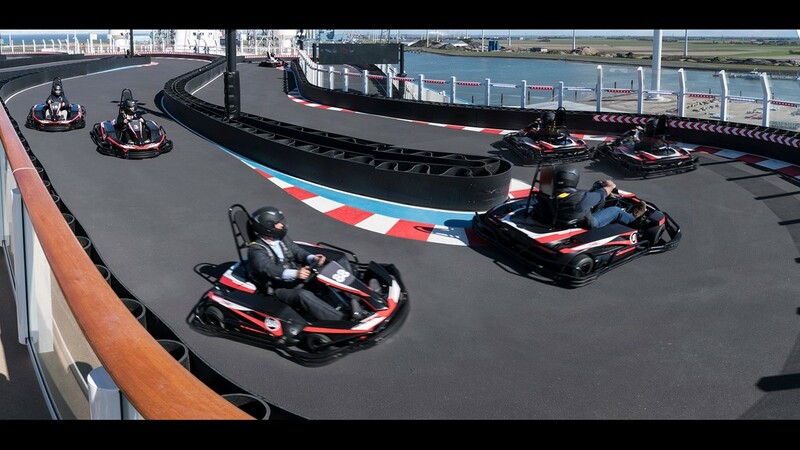 While it may look boxy from the outside, Norwegian Bliss will boast a wide array of fun zones in its interior and deck-top spaces that include a two-deck-high racing track -- a first for a North American-based vessel. 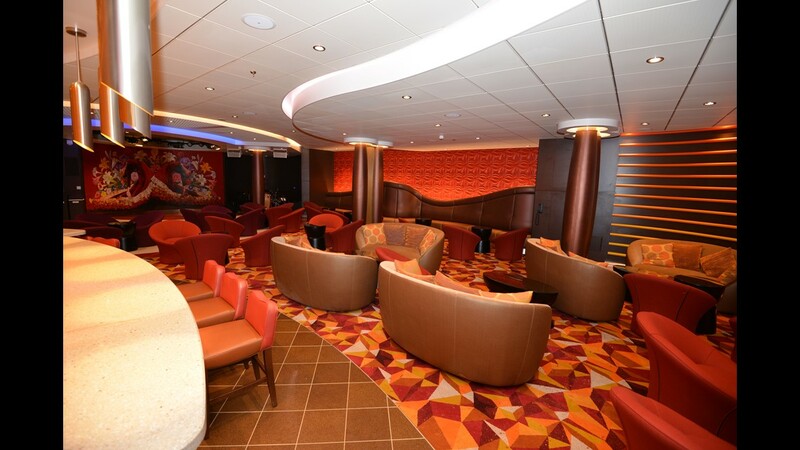 Among the more unusual attractions on Norwegian Joy is the Galaxy Pavilion, which is home to virtual reality experiences, simulator rides and hover craft bumper cars. The 164,600-ton Norwegian Escape is Norwegian Cruise Line's largest ship ever. 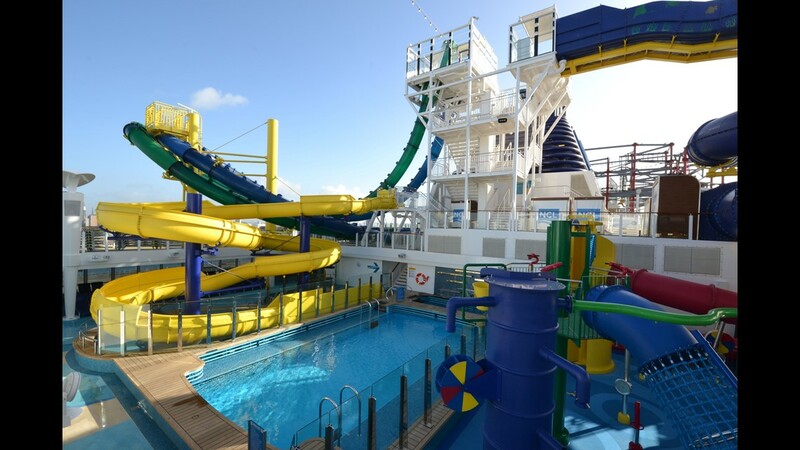 The Norwegian Escape's top deck is home to the Aqua Park, a family-friendly fun zone billed as one of the largest of its kind at sea. 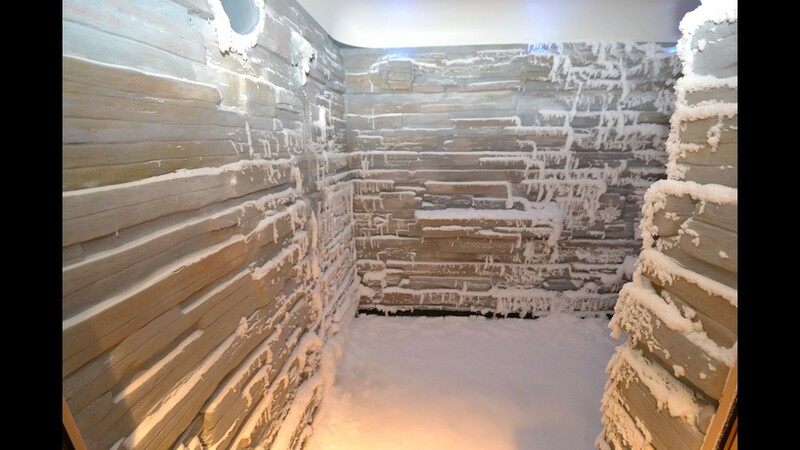 Norwegian Cruise Line's new Norwegian Escape is home to a flurry-filled Snow Room that is designed to invigorate blood flow. 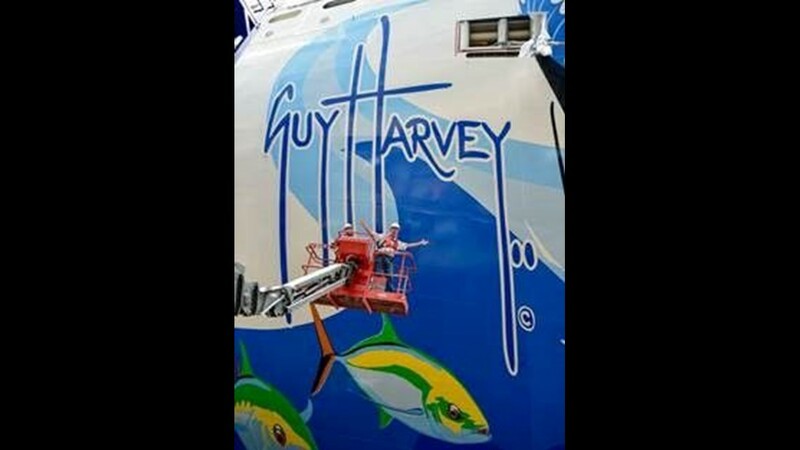 The scale of the hull art on today's mega-ships becomes clear when viewing this close-up photo of artist Guy Harvey near his signature on Norwegian Escape. 12. Royal Caribbean's Liberty of the Seas. Built in 2007, Liberty was the second of three vessels in Royal Caribbean's Freedom Class of ships. It measures 155,889 tons. 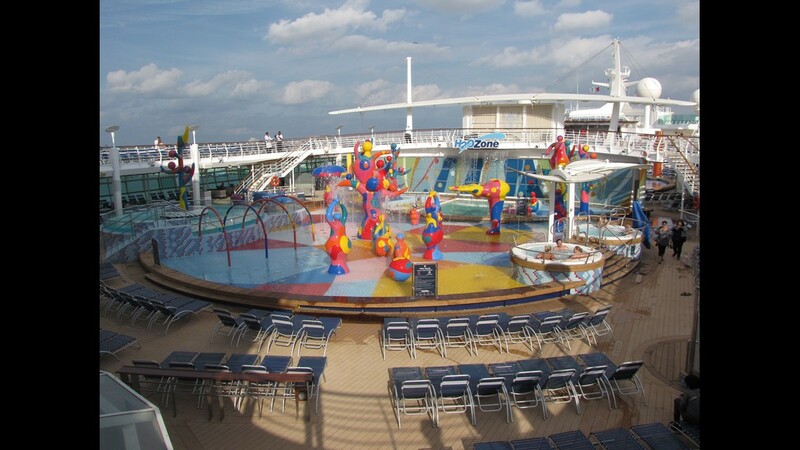 The top decks of Liberty of the Seas are chock full of amusements including this watery play zone for kids. 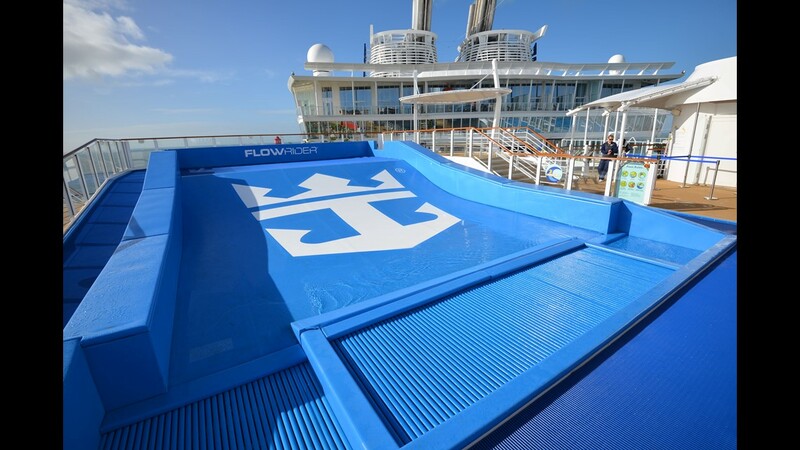 Royal Caribbean's Freedom Class ships including Liberty of the Seas are among more than a dozen Royal Caribbean vessels with a FlowRider surfing pool. 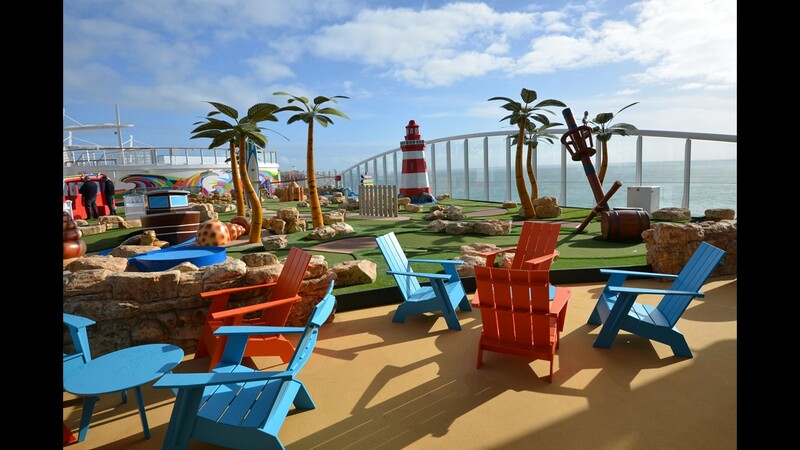 Liberty of the Seas also offers miniature golf, a staple of Royal Caribbean ships. 13. 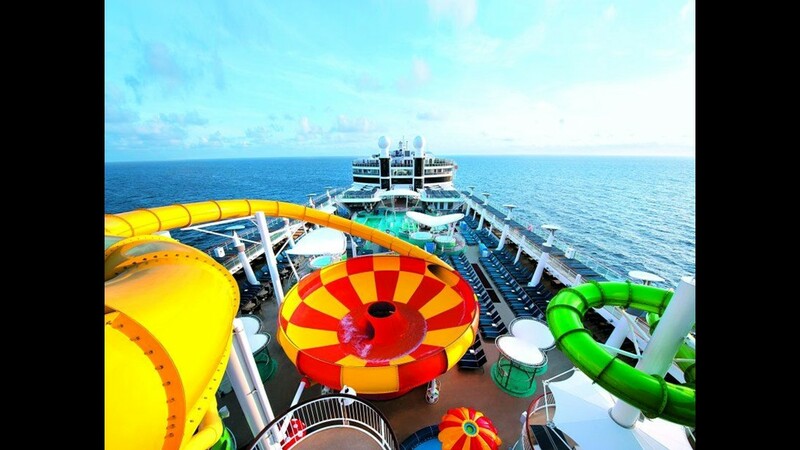 Norwegian Epic. 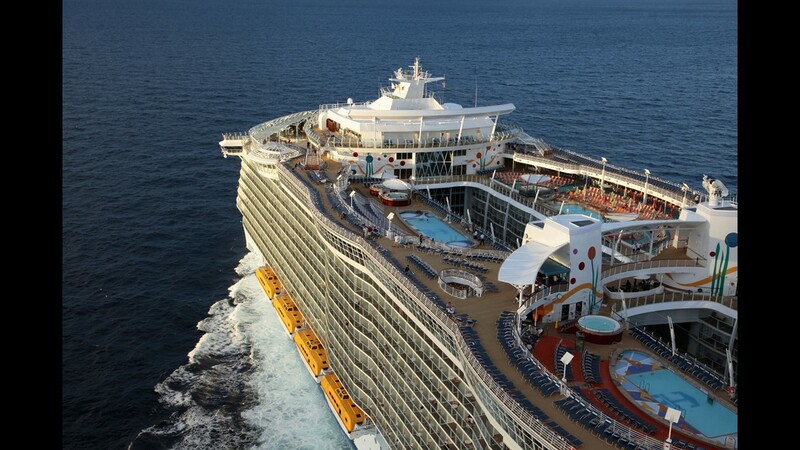 Unveiled in 2010, this one-off Norwegian Cruise Line ship measures 155,873 tons. 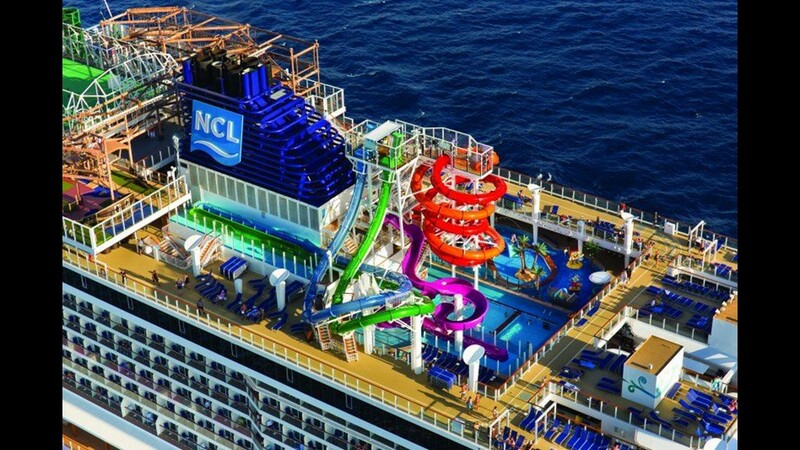 Norwegian Epic had one of the biggest water parks on a cruise ship ever at the time of its debut. 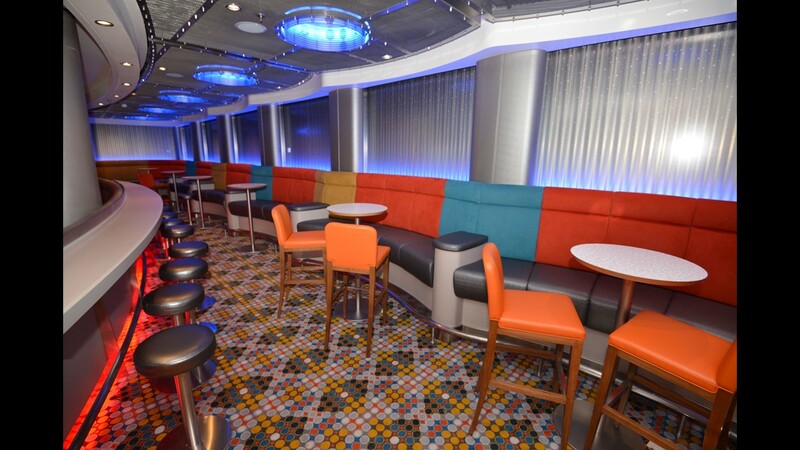 Among the notable features on Norwegian Epic is a bowling alley. 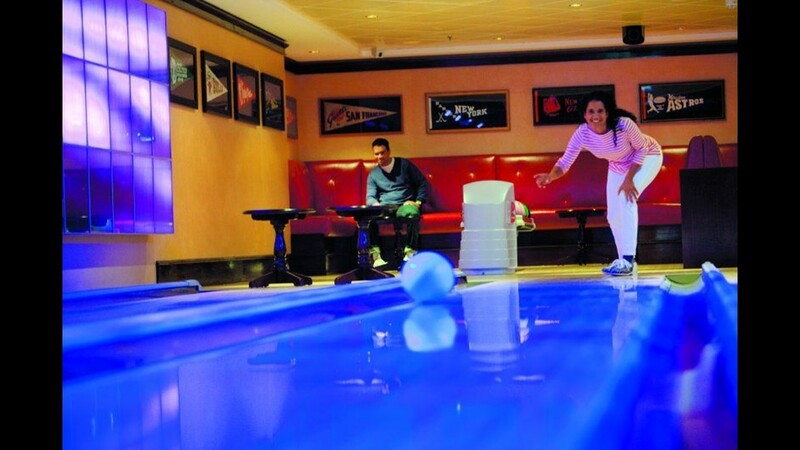 Bowling is offered on several Norwegian Cruise Line ships. 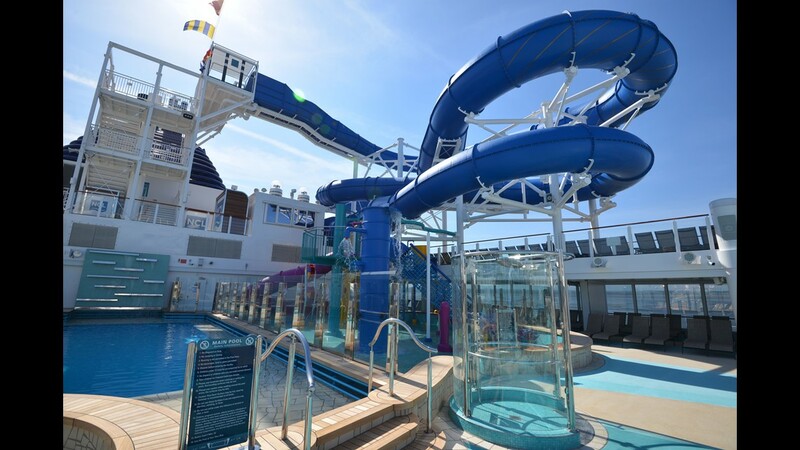 Like several other Norwegian Cruise Line ships, Norwegian Epic has a private pool are for passengers staying in top suites. 14. Royal Caribbean's Freedom of the Seas. 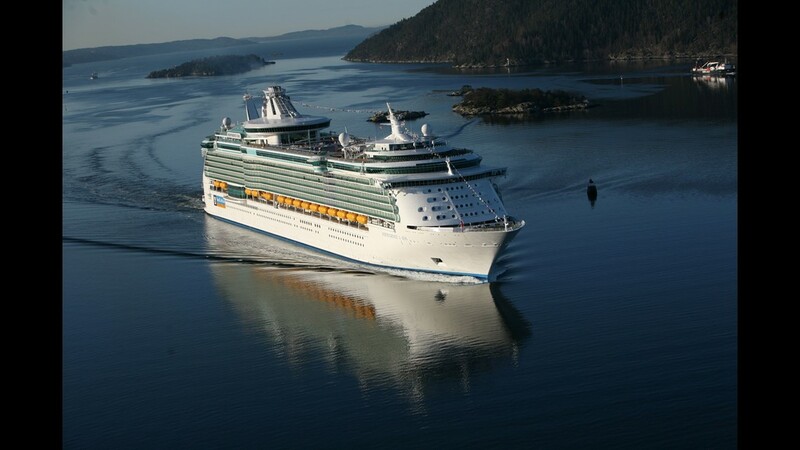 Christened in 2006, Freedom of the Seas was the biggest cruise ship in the world at the time. It measures 154,407 tons. 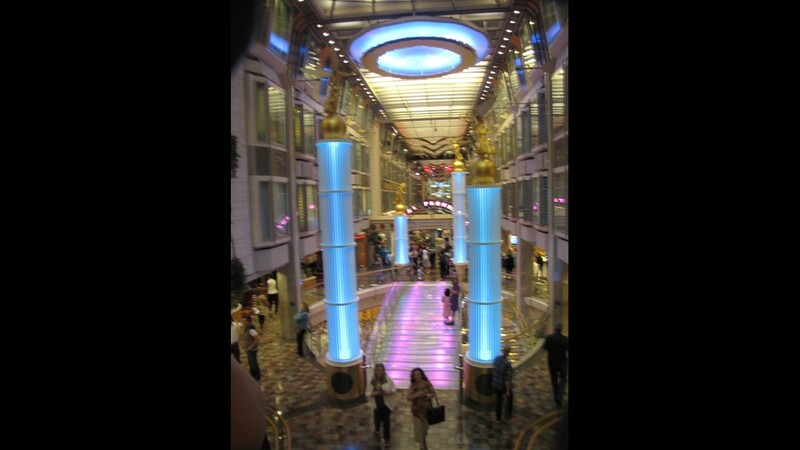 A view of the Royal Promenade on Freedom of the Seas, home to many shops and restaurants onboard, as well as the "DreamWorks Move it, Move it Parade." 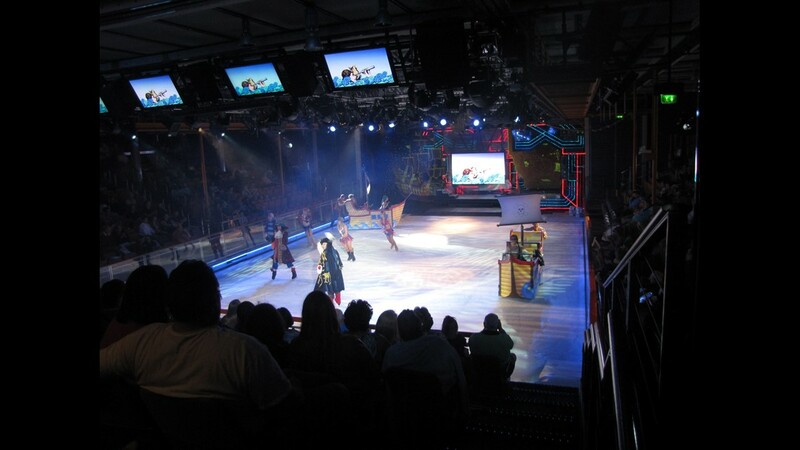 Royal Caribbean's Freedom of the Seas also boasts an ice rink, which offers skate rentals to guests. Royal Caribbean's Freedom of the Seas offers an H2O zone water park. 15. Royal Caribbean's Independence of the Seas. Dating to 2008, Independence measures 154,407 tons, the same as sister ship Freedom of the Seas. 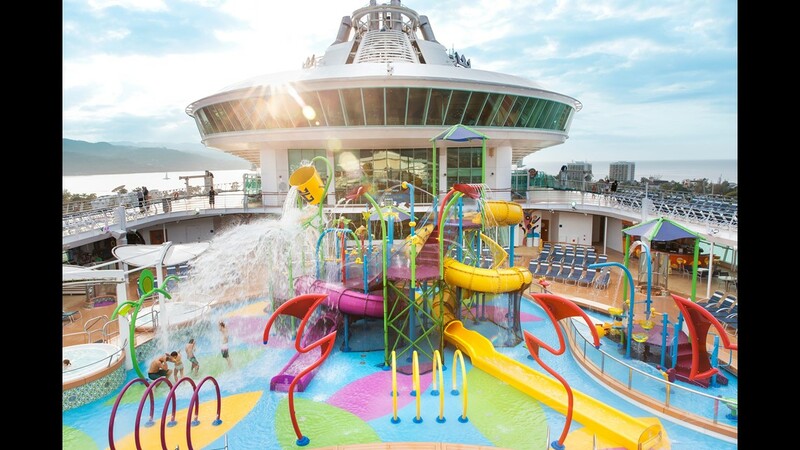 Like other large Royal Caribbean ships, Independence of the Seas offers a wide range of deck-top fun zones including a kiddie splash area. 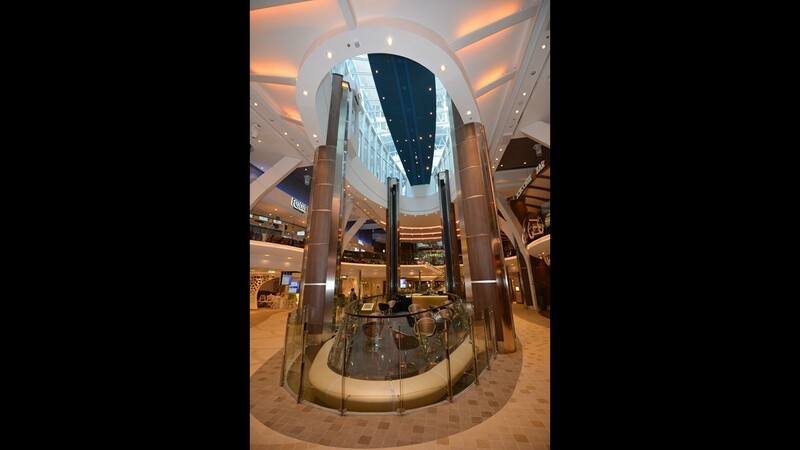 The main restaurant on Royal Caribbean's Independence of the Seas can hold more than 1,000 passengers at a time. 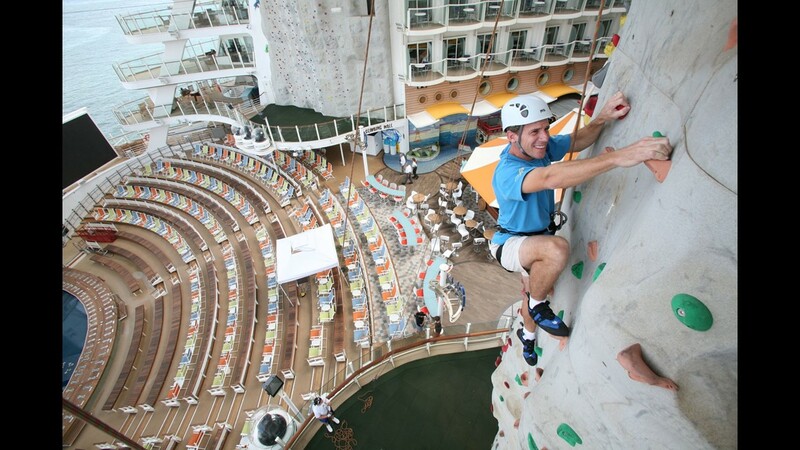 Like other Freedom Class ships, Independence of the Seas features a soaring rock climbing wall on one of its top decks. 16. 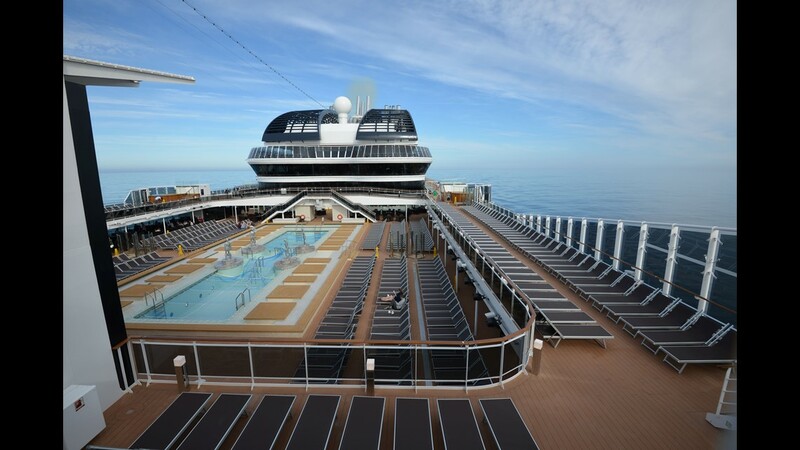 MSC Seaside. 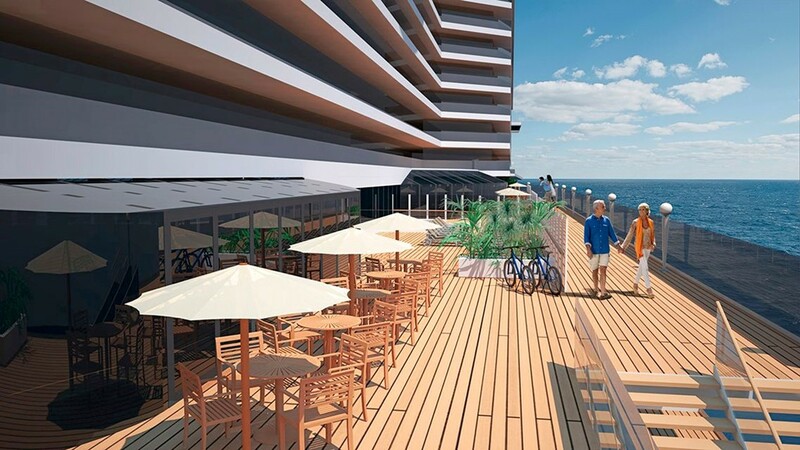 Unveiled in 2017, this Florida-based MSC Cruises measures 153,516 tons. 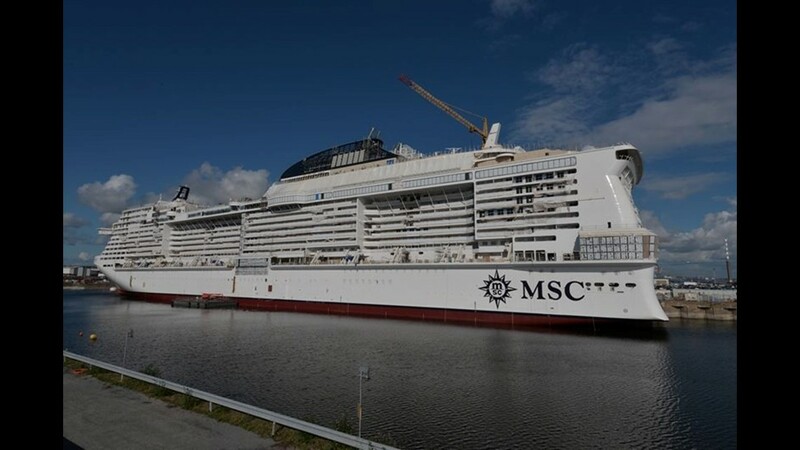 MSC Seaside was specifically designed with a Miami Beach-style to match its permanent home in Miami. 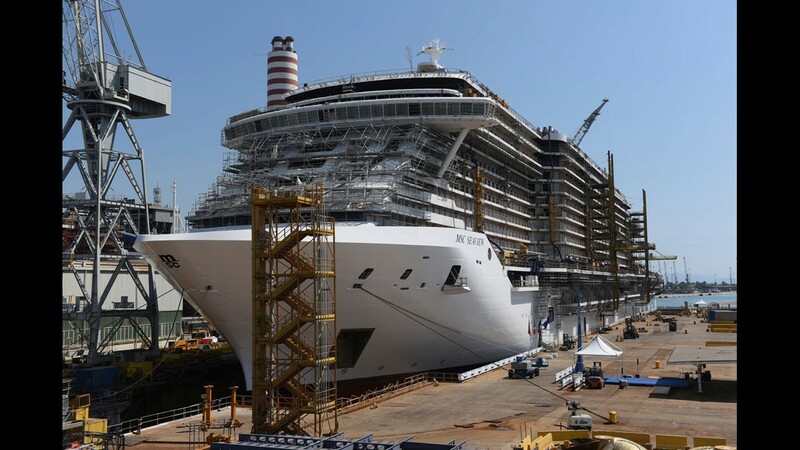 While MSC Cruises is based in Europe, the ship is aimed at the American market. 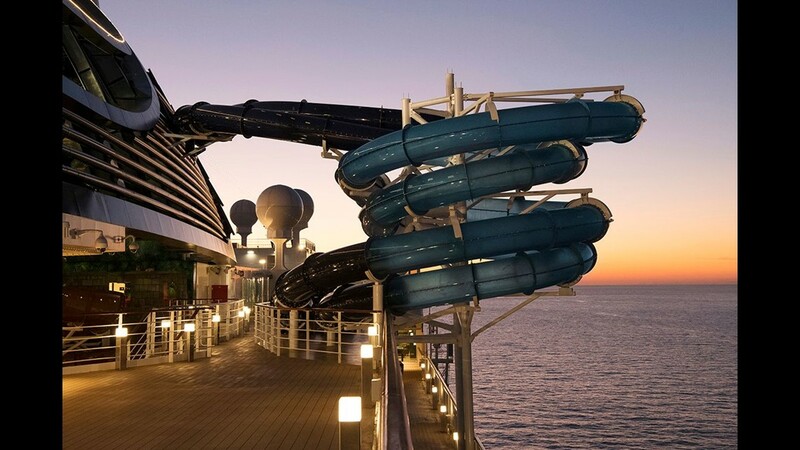 MSC Seaside features all the trappings of a major mega-resort including swirling water slides and other fun zones. 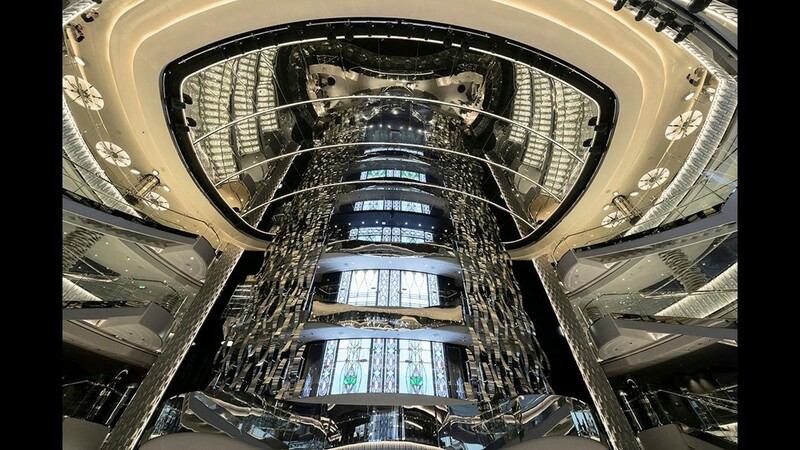 The soaring atrium at the center of MSC Seaside's interior areas. 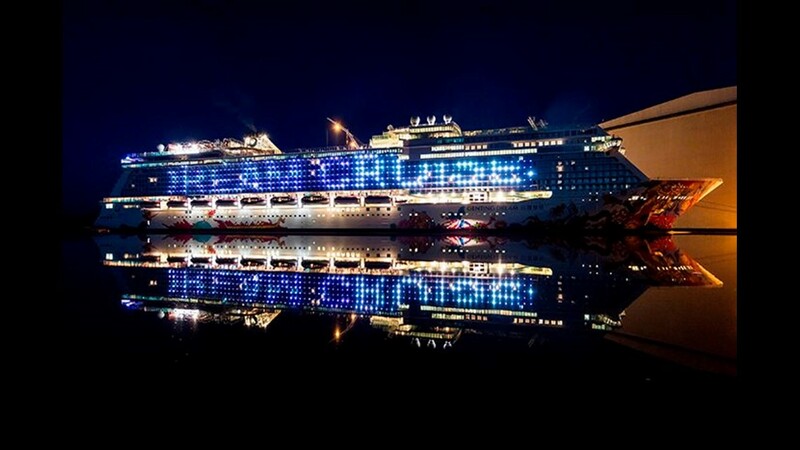 Also boasting an explosion of color on its hull is Asia-based Dream Cruises' other ship, the Genting Dream. It debuted in late 2016. In addition to a colorful hull, the Genting Dream can do this. 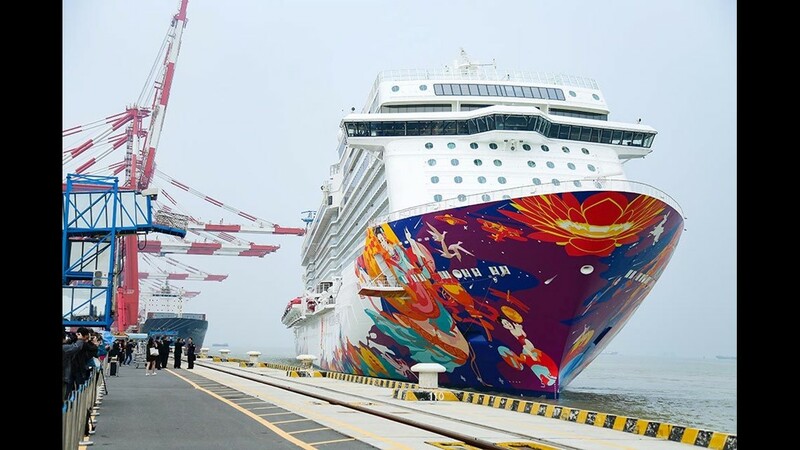 An explosion of color seems to have been the design brief for the hull art of Asian line Dream Cruises' latest ship, World Dream. It began sailing out of the Chinese port of Guangzhou in November. 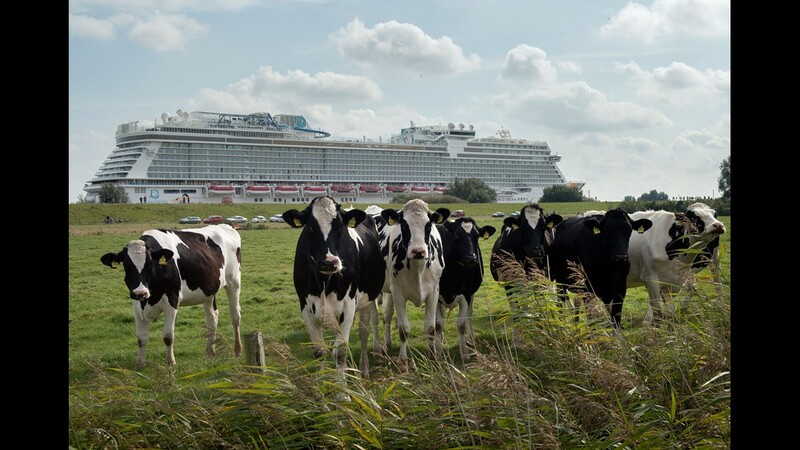 A flock of cows appear to be unimpressed of the cruise ship 'World Dream' departing on the Ems river in Papenburg, northern Germany on Sept. 17, 2017. The vessel, built for the Chinese shipping company 'Dream Cruises', measures 335 meters in length and is due to pass the Ems river towards the North Sea backwards over a distance of more than 30 kilometers. The 'World Dream' will operate on the Asian market. 19. Queen Mary 2. 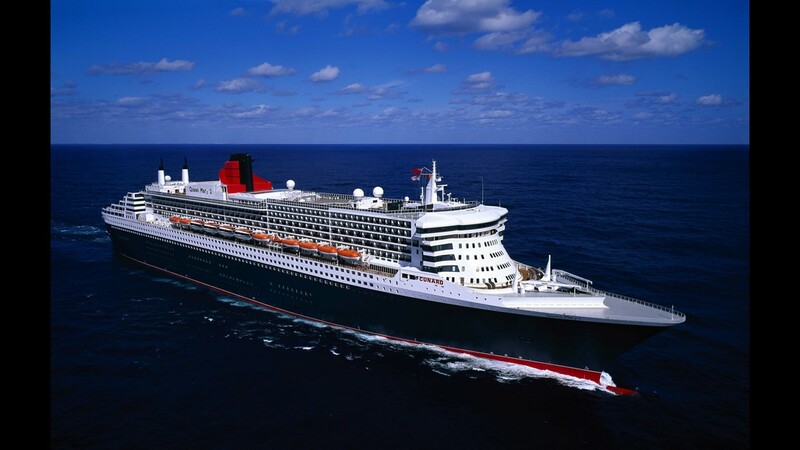 Unveiled in 2004, this grand ocean liner was the world's largest passenger ship at the time of its debut, and its arrival marked a comeback for the storied Cunard Line. It measures 149,215 tons. Designed with a sleek profile and wave-piercing bow, Queen Mary 2 is purpose-built to offer trans-Atlantic crossings like the ocean liners of old. No. 2: MV Queen Mary 2. 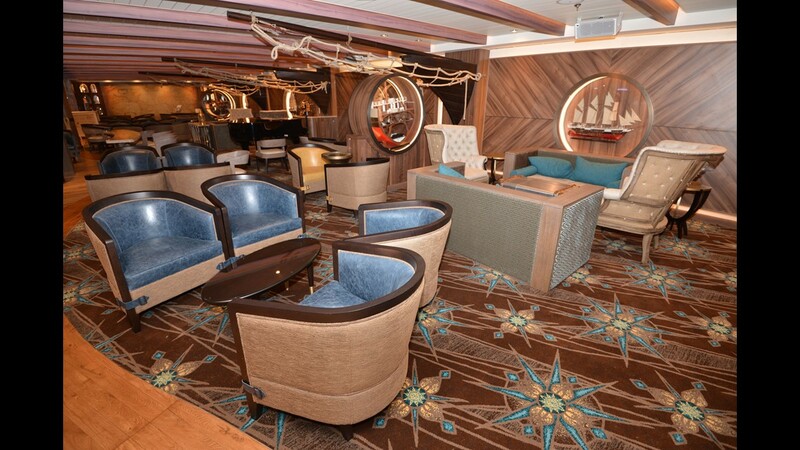 Following the ship’s refurbishment or “remastering,” the interiors look better than ever. 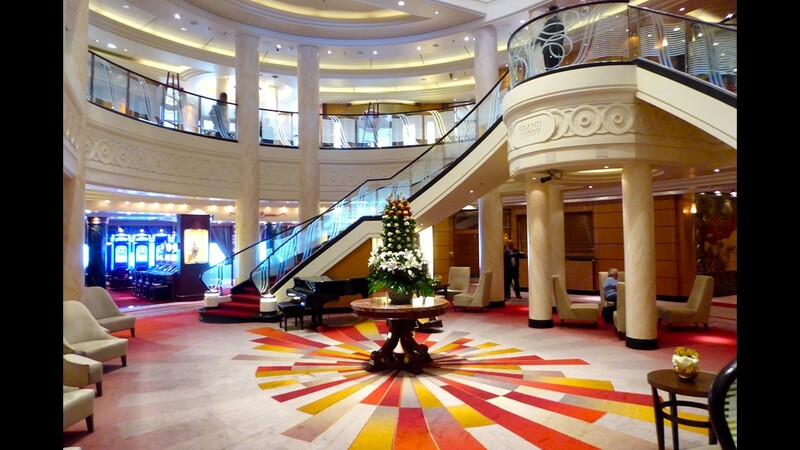 Passengers embark the QM2 via the Grand Lobby, which was given new carpeting and a more open floor plan after the removal of a pair of panoramic elevators. No. 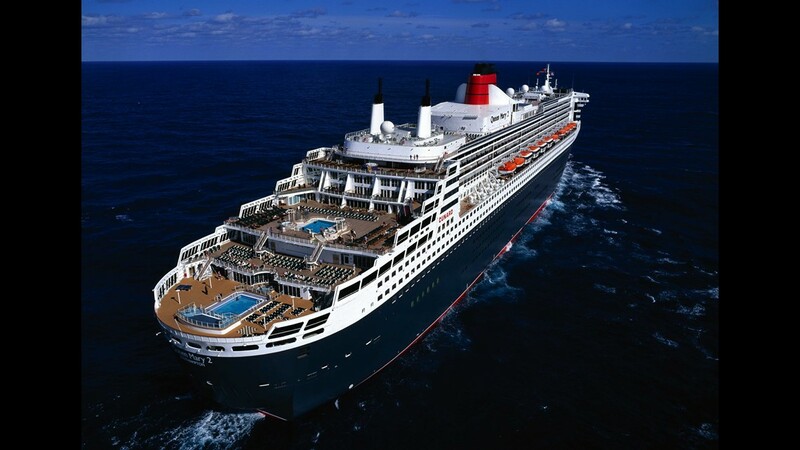 2: MV Queen Mary 2. 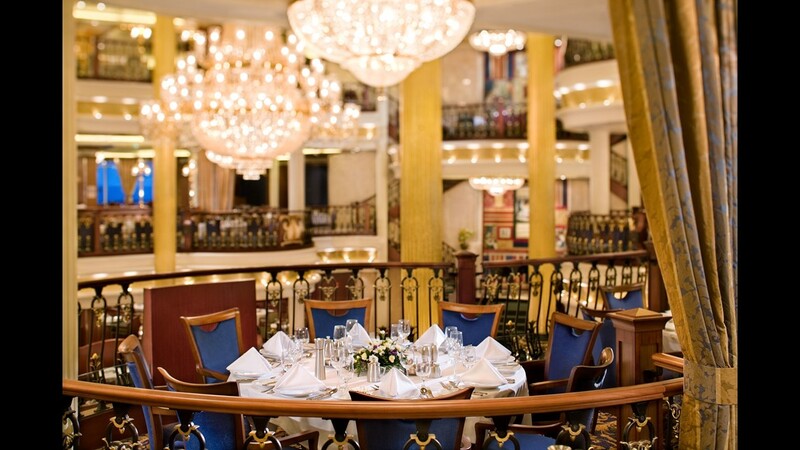 One of the grandest dining rooms at sea, the Britannia Restaurant is for the majority of QM2’s passengers occupying standard category staterooms. 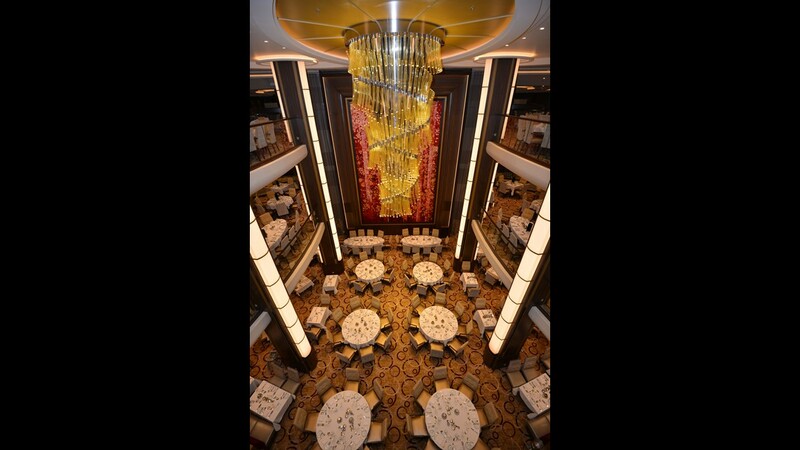 It features a massive tapestry depicting the QM2 in New York harbor and a soaring skylight. 20. Norwegian Breakaway. 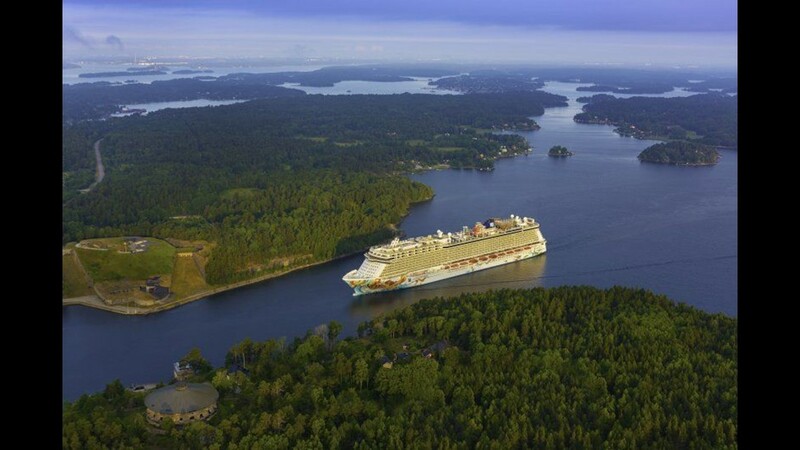 Unveiled in 2013, this 145,655-ton ship was the first of Norwegian Cruise Line's Breakaway Class of vessels. It features hull art designed by artist Peter Max. 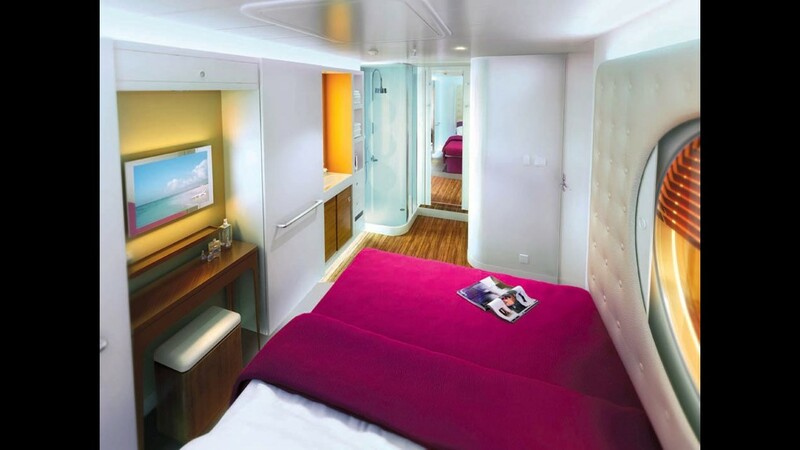 Norwegian Breakaway was one of the first Norwegian Cruise Line ships with studio cabins for single travelers. 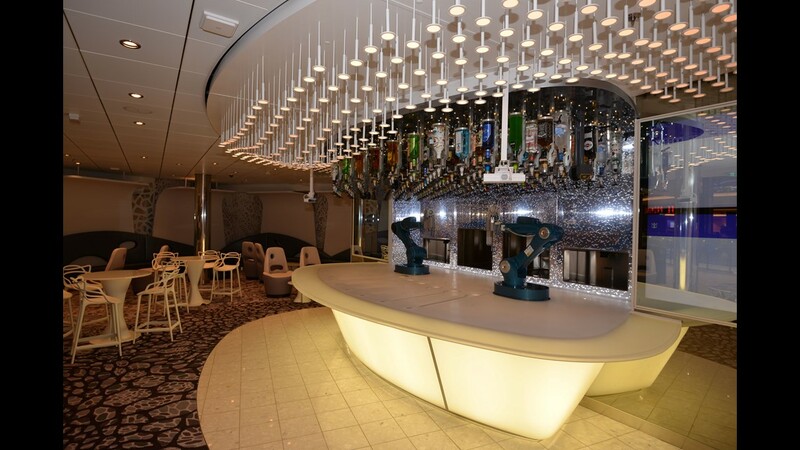 The concept debuted in Norwegian Epic. 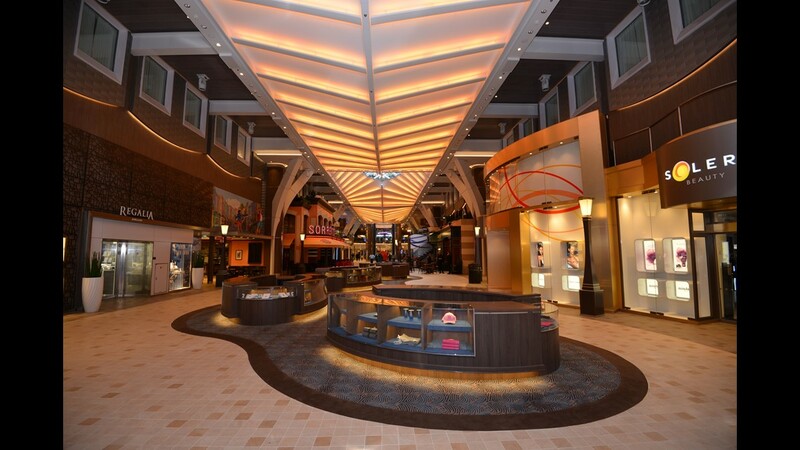 The hub of Norwegian Breakaway's interior spaces is a three-deck-high atrium-like space. 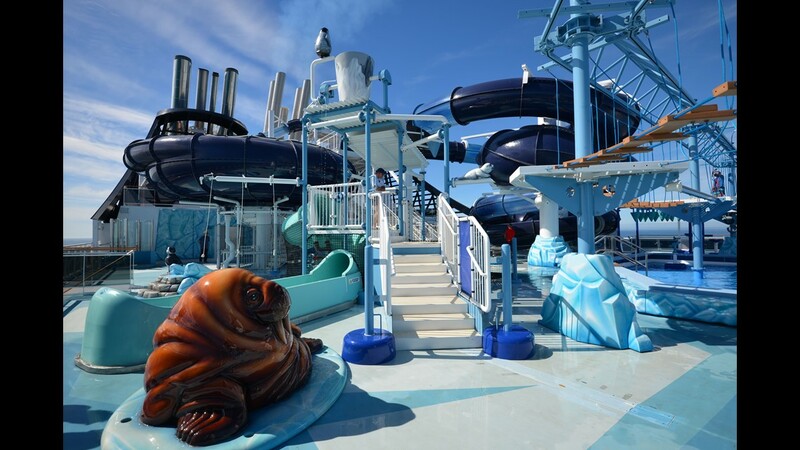 Norwegian Breakaway offers a large water park area with multiple water slides. 21. Norwegian Getaway. A sister ship to Norwegian Breakaway, Getaway measures an identical 145,655 tons and carries 3,963 passengers at double occupancy. 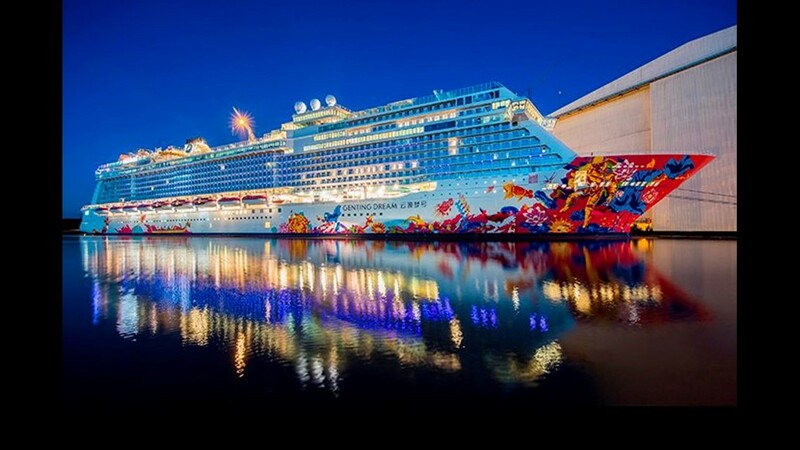 Christened in 2014, Norwegian Getaway features a massive mural on its hull with swirling motifs designed by Miami artist David "Lebo" Le Batard. 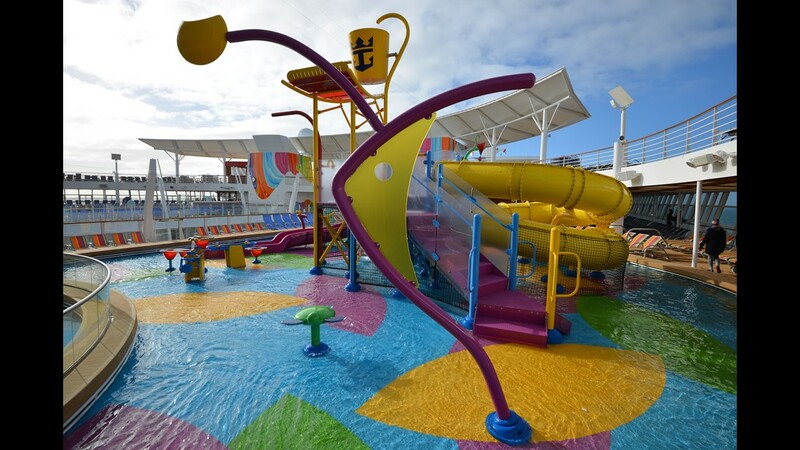 Like other recent Norwegian Cruise Line ships, Norwegian Getaway offers a massive water park area on its top deck along with pools and other fun zones. 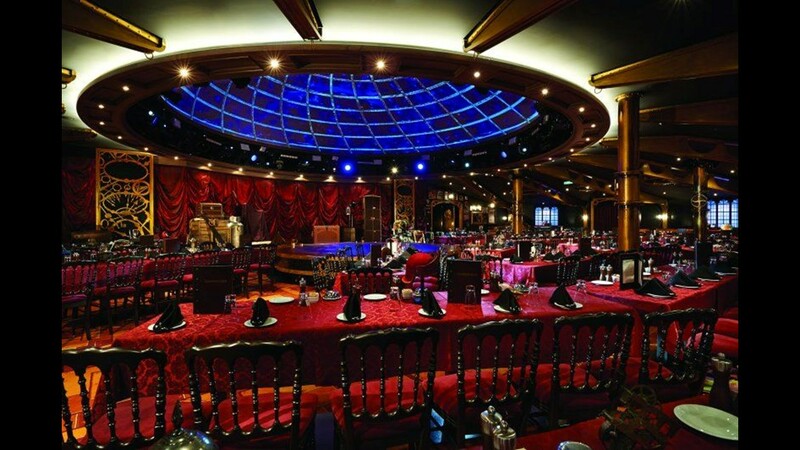 The interior areas of Norwegian Getaway are filled with eateries, bars and nightspots including a special-effects laden house of magic called the Illusionarium. 22. Majestic Princess. 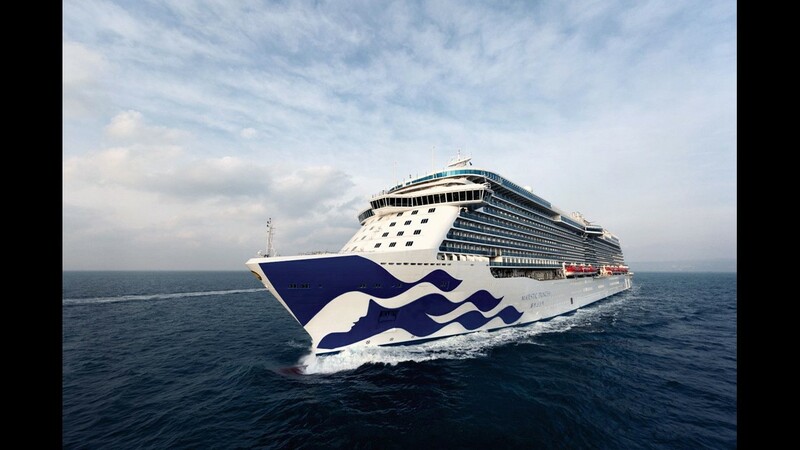 At 144,216 tons, Majestic Princess is the latest and largest vessel in Princess Cruises' new Royal Class of ships. It began sailing in 2017. 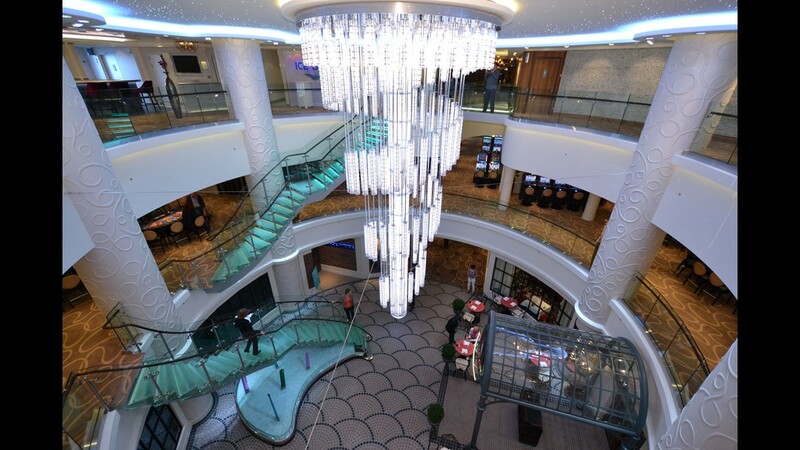 Initially custom-built for the Chinese market, Majestic Princess offers a large casino and extensive shopping offerings, features that appeal to travelers based in China. 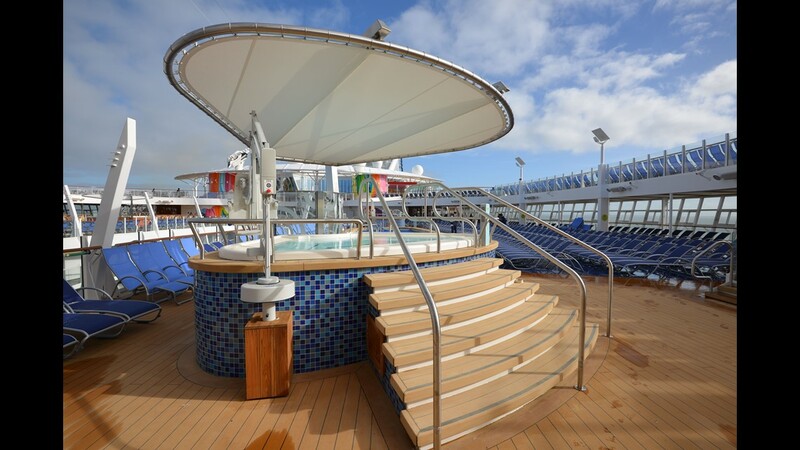 Among the allures of Majestic Princess is a large pool that can be covered with a glass roof during inclement weather. 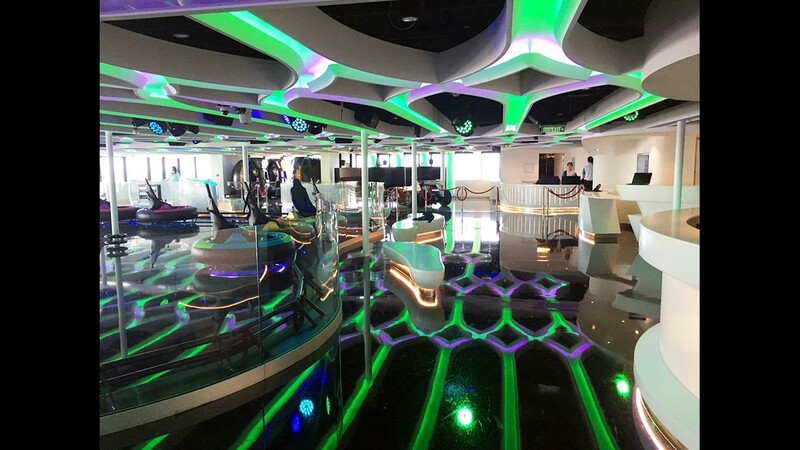 Among attractions added to Majestic Princess to appeal to the Chinese market is an area with karaoke rooms. 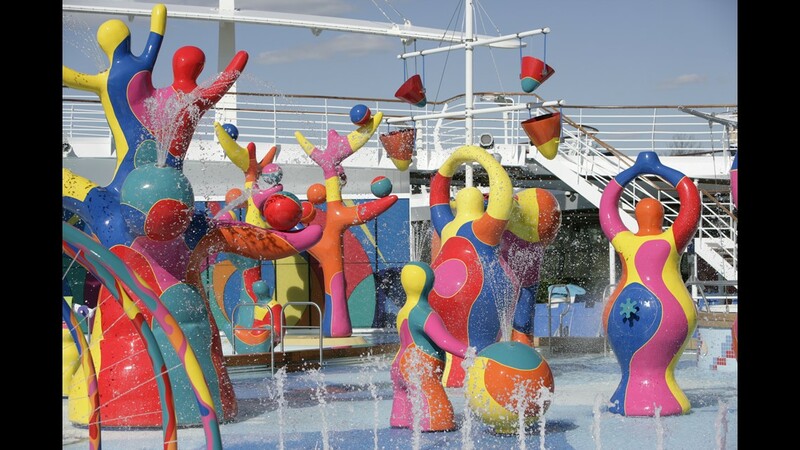 Another line that has gotten more bold with hull art in recent years is UK-based P&O Cruises. Aimed at the British market, the line has literally wrapped itself in the British flag with its recent hull art. 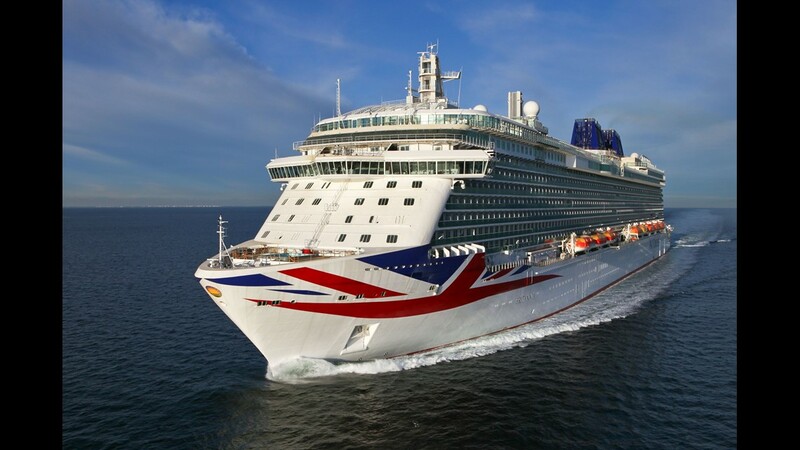 Here, P&O Cruises' 2015-built flagship Britannia. 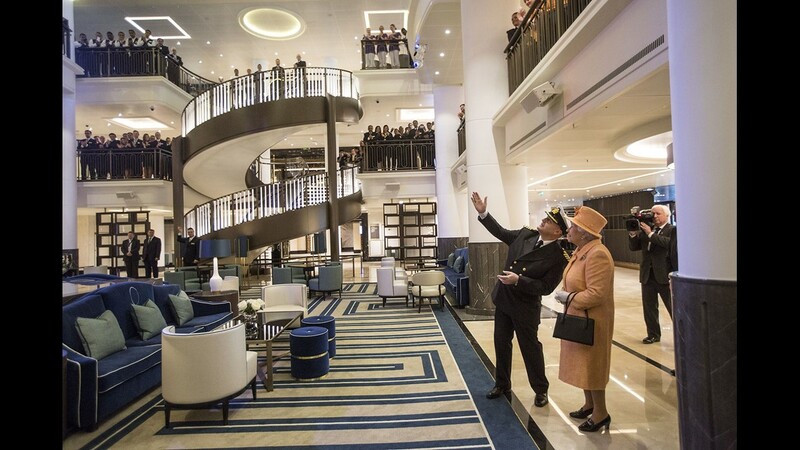 Paul Brown, left, captain of the new cruise ship Britannia, shows off the ship to Queen Elizabeth II on March 10 at Ocean Cruise Terminal in Southampton, England. 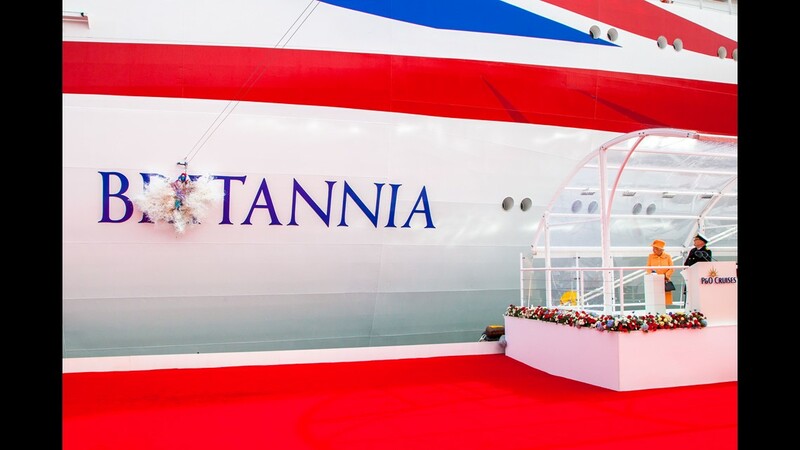 The scale of the British flag painted on the sides of P&O Cruises' Britannia was evident when Britain's Queen Elizabeth II stood near the vessel at its March 10, 2015 christening. 24. Royal Princess. 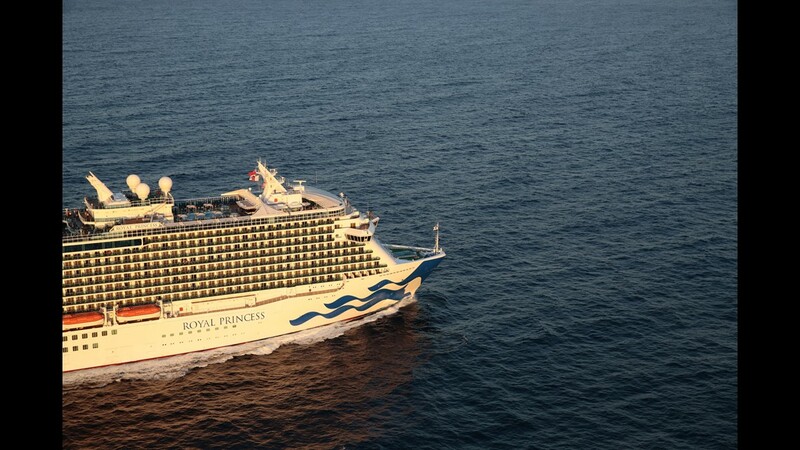 Dating to 2013, Royal Princess was the first of Princess Cruises' Royal Class of ships. It measures 142,714 tons. 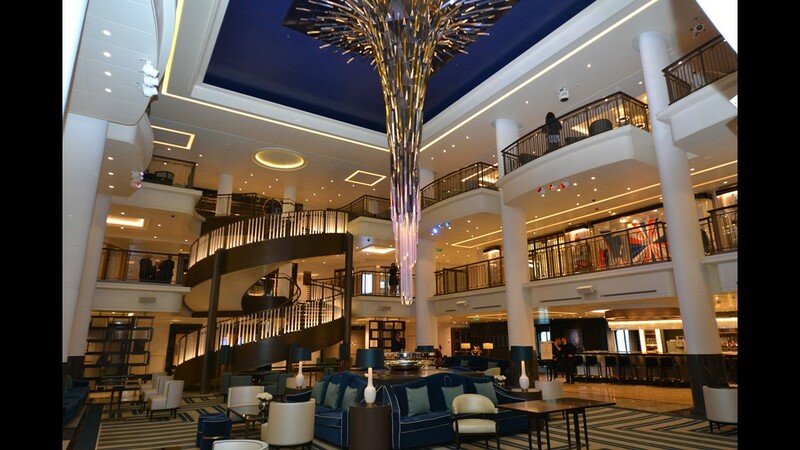 The Royal Class of ships at Princess Cruises are the line's largest ever and have a capacity for more than 3,500 passengers at double occupancy. 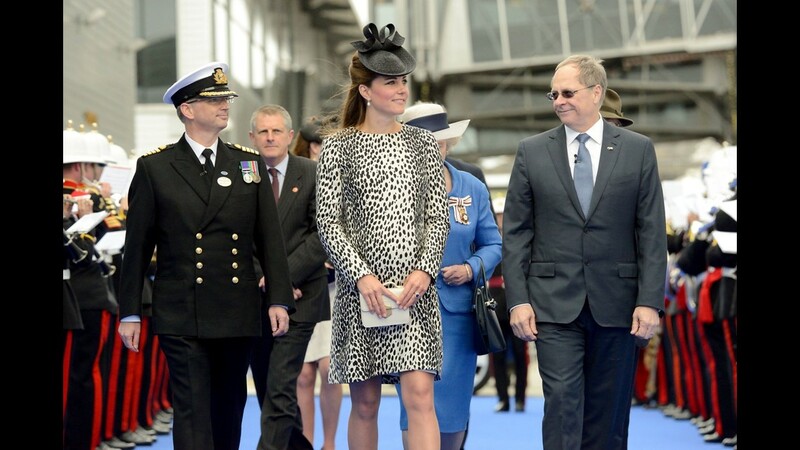 Catherine, Duchess of Cambridge, arriving for the christening ceremony of Princess Cruises' Royal Princess on June 13, 2013. 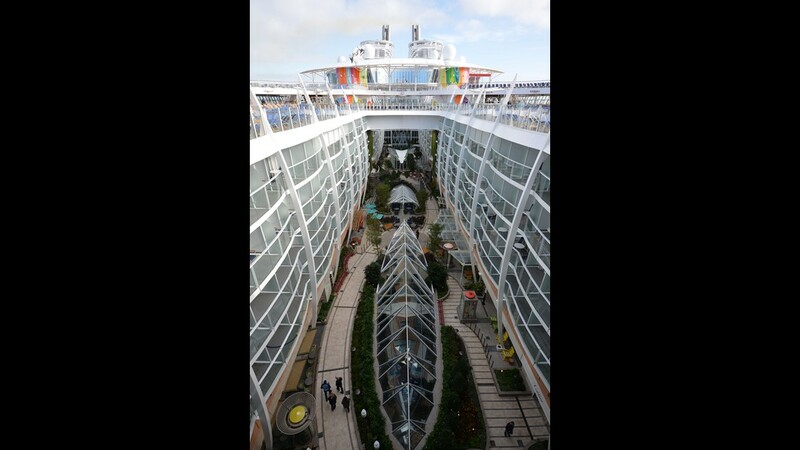 Like Skywalkers aboard Grand Princess, the big-ticket item aboard Royal Princess and Regal Princess was the Skywalk. 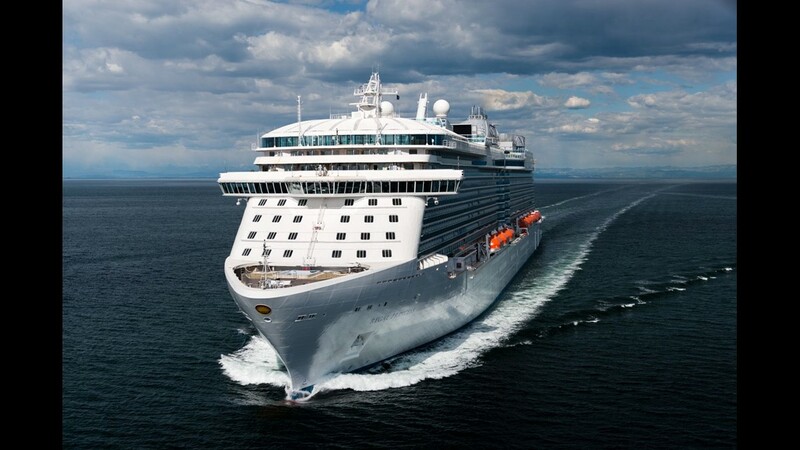 Princess Cruises' newest ship, the 3,560-passenger Regal Princess, debuted in May 2014 in the Mediterranean. 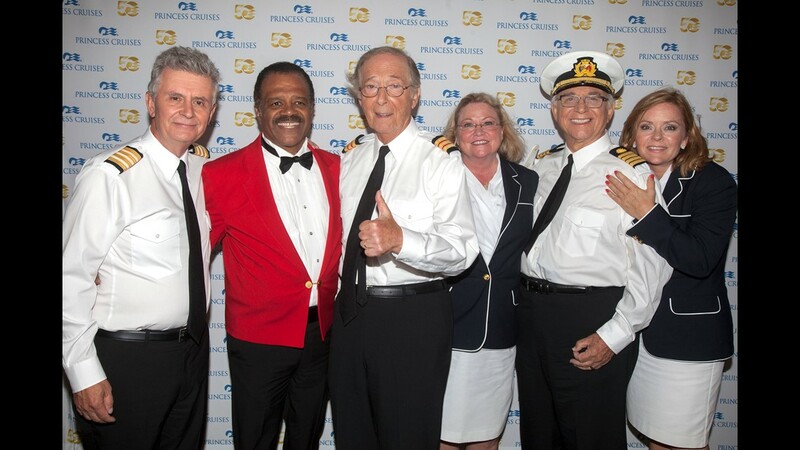 The original cast of The Love Boat (right to left: Jill Whelan, Gavin MacLeod, Lauren Tewes, Bernie Kopell, Ted Lange and Fred Grandy) will serve as godparents to the Regal Princess. 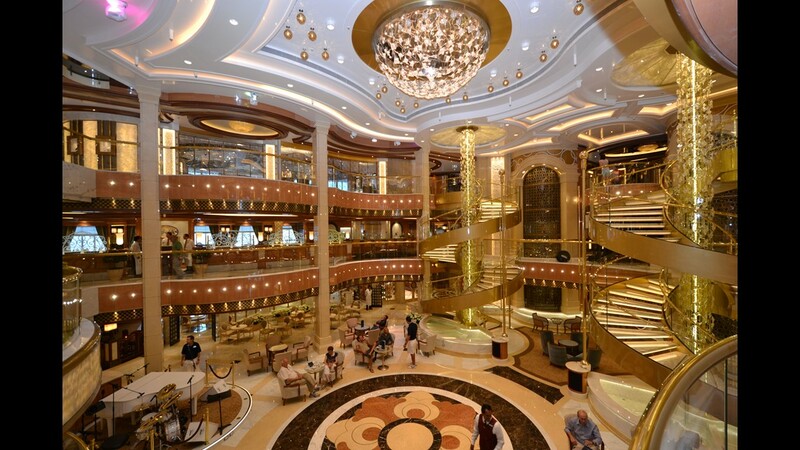 Both Regal Princess and Royal Princess are classy, welcoming ships with plenty of public rooms. 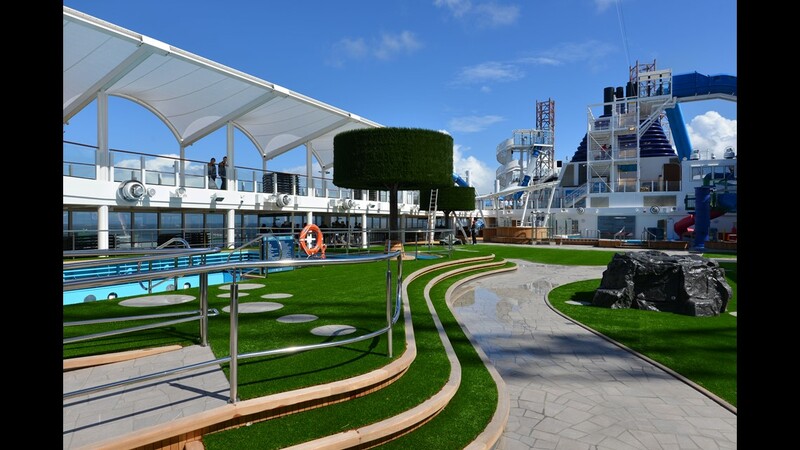 As with the Piazza on the Royal Princess, the Piazza on the Regal Princess is 50% larger than similar spaces on previous Princess ships and features natural lighting from curving walls of glass facing the sea. Coming soon: The list of 25 biggest cruise ships will be changing in June 2018 when a new MSC Cruises ship, MSC Seaside, is christened. Now under construction in Italy, it will measure about 154,000 tons, putting it at No. 17 in the rankings. Coming soon: The list of the 25 largest cruise ships will change yet again in November 2018 with the debut of German line Aida Cruises' Aidanova. Measuring more than 180,000 tons, the vessel will be the largest ever for Aida and one of the five biggest cruise ships ever built by any line. 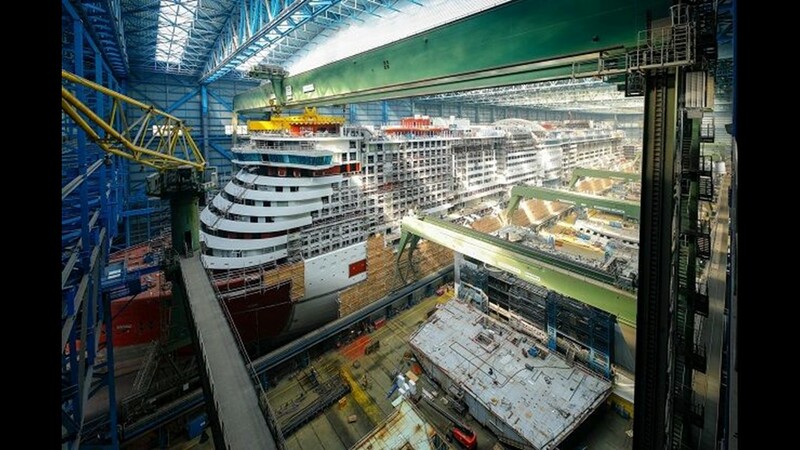 It is shown here under construction at the Meyer Werft shipyard in Papenburg, Germany. 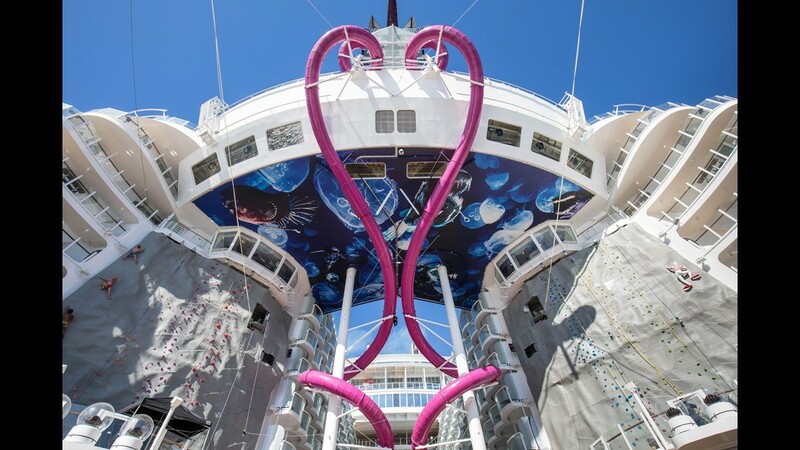 One of the biggest trends in cruising in recent years has been the proliferation of giant and colorful "hull art" on the hulls of ships. Here, one of Norwegian Cruise Line's newest vessels, the 3,963-passenger Norwegian Getaway. Christened in 2014, Norwegian Getaway features a massive mural with swirling motifs and a giant mermaid as well as tropical palm trees and pelicans. 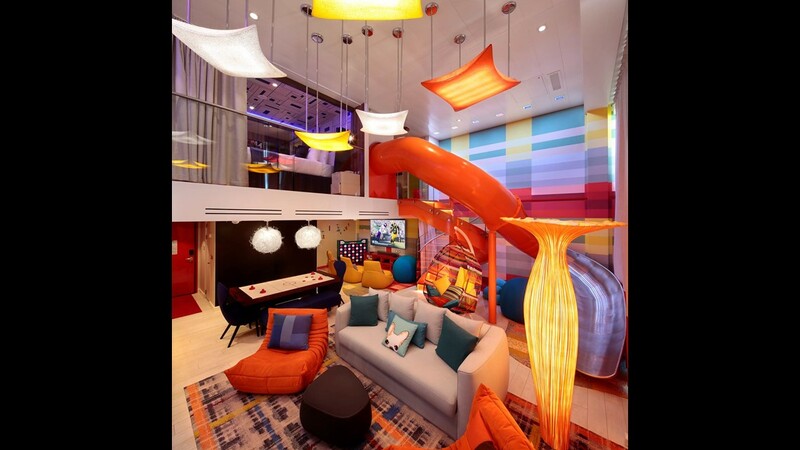 It was designed by Miami artist David "Lebo" Le Batard. 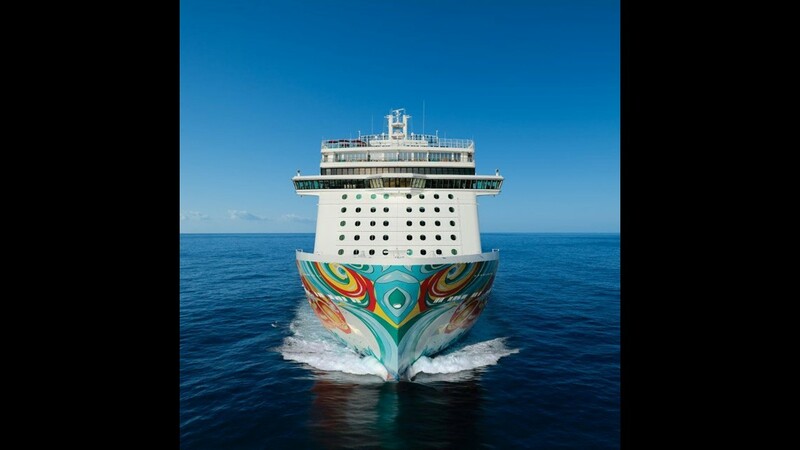 Norwegian Cruise Line was a pioneer in adding flamboyant designs to the hulls of its ships. It first played with the concept in 2002 on its then-new Norwegian Dawn. 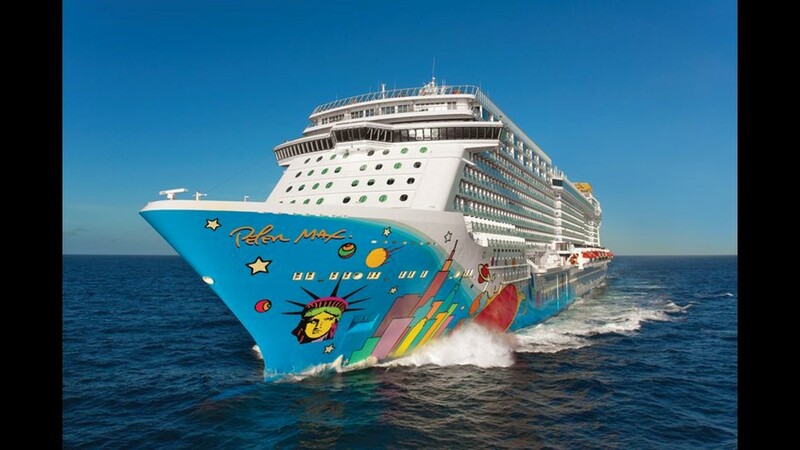 Norwegian Dawn's colorful hull art, which runs the entire length of the ship, was designed by the London firm SMC Design. All Norwegian ships that have come out since have featured similarly colorful hull art, and the line has retroactively added hull art to older vessels, too. 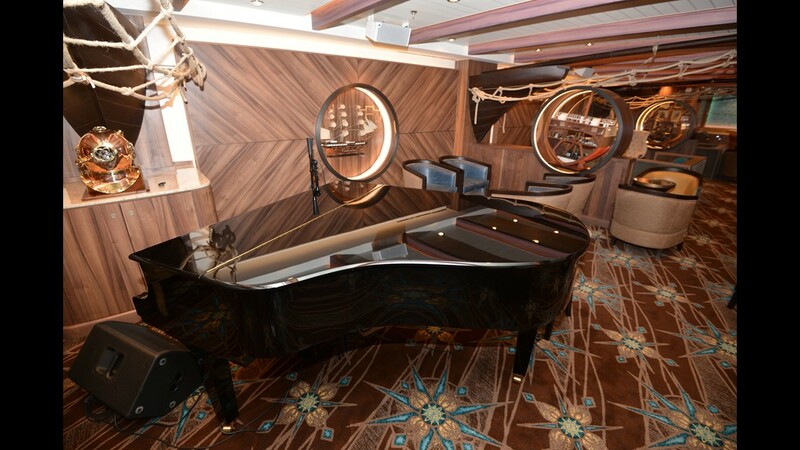 Hull art on Norwegian ships has gotten ever more elaborate in recent years, with the line's newest vessels featuring designs by well-known artists. 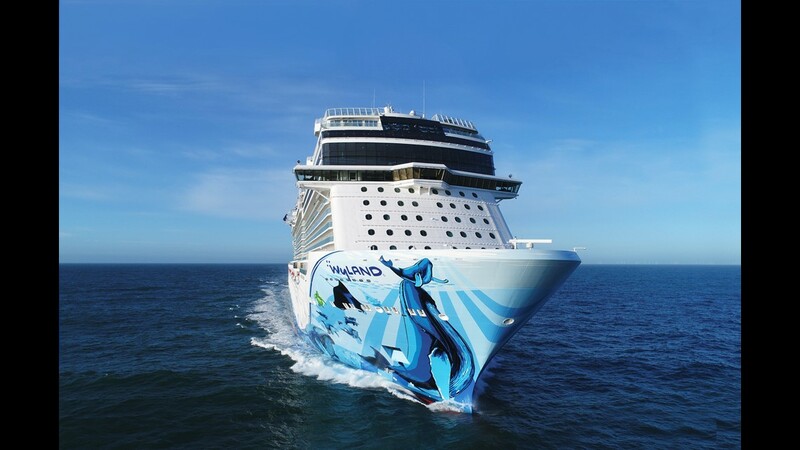 The hull of the two-year-old Norwegian Escape has a design with a giant merlin and other ocean wildlife created by noted Jamaican ocean conservationist and marine wildlife artist Guy Harvey. Yes, those are giant red-and-orange lips on the front of a cruise ship. German line Aida Cruises has made the multi-deck-high lips on its ship hulls a signature. Aida is credited with starting the hull art trend way back in the 1990s. 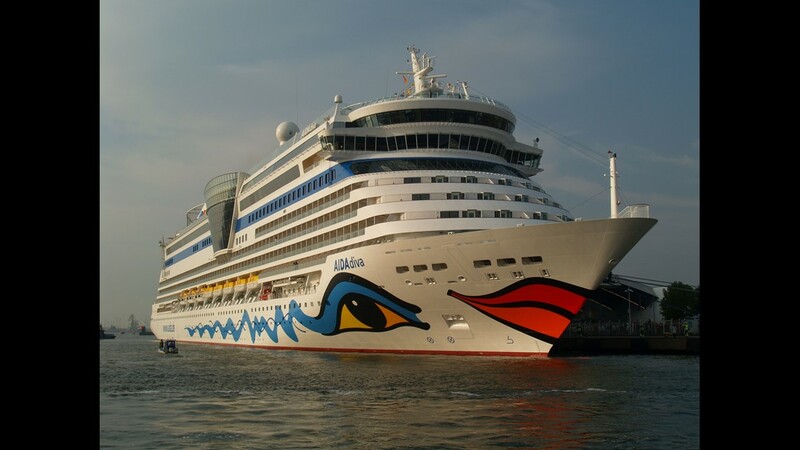 Other Aida ships with the giant, colorful lips include AIDAbella, which debuted in 2008. On some Aida ships, the lips take up more than 1,600 square feet of space. Getting those giant red-and-orange lips onto Aida Cruises ships isn't easy. Here, the hull art being applied to the AIDAprima, which entered service in 2016. One line that is just dipping its toe into the hull art trend is Princess Cruises. 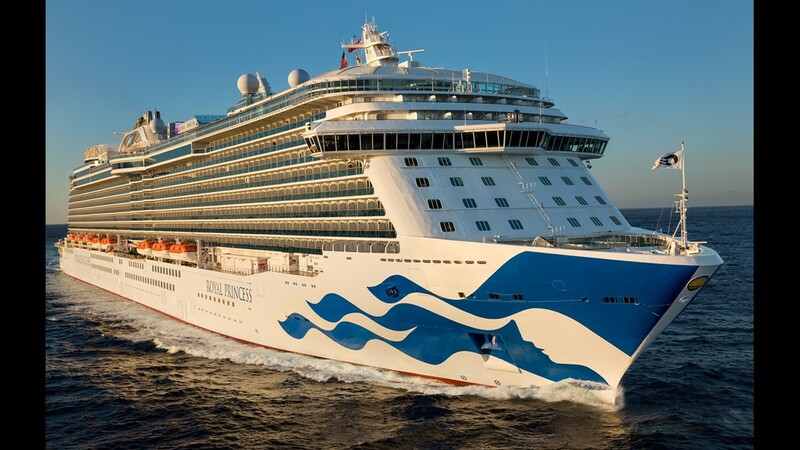 Princess's new Majestic Princess, unveiled in early 2017, was the line's first ship with hull art, and the line now is adding hull art to other vessels such as the Royal Princess. 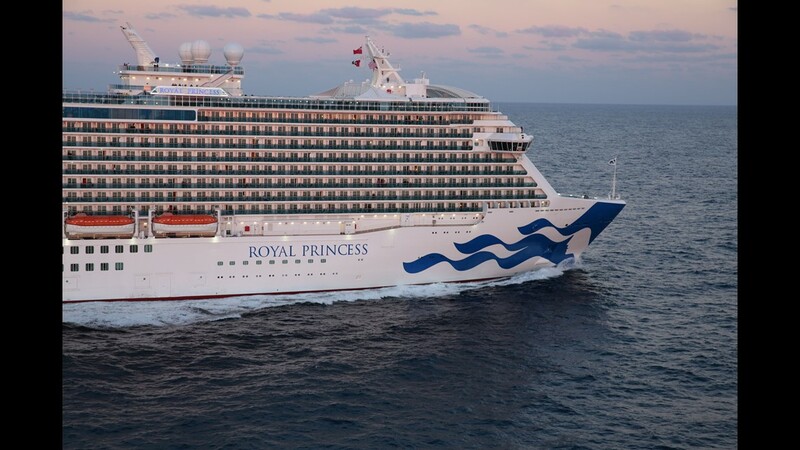 As seen here on Royal Princess, the new Princess hull art is a larger-than-life version of the line's stylized, blue-and-white "seawitch" logo. Until recently, Royal Princess (shown here in 2013) and other Princess ships were almost devoid of hull markings. The line was known for ship exteriors with a clean white look. From the front, the Princess seawitch design has a bold, geometric look at can be seen from miles away. Princess is adding the design to ships one-by-one as they undergo previously schedule overhauls in dry dock. The British flag isn't the only flag that adorns a cruise ship. 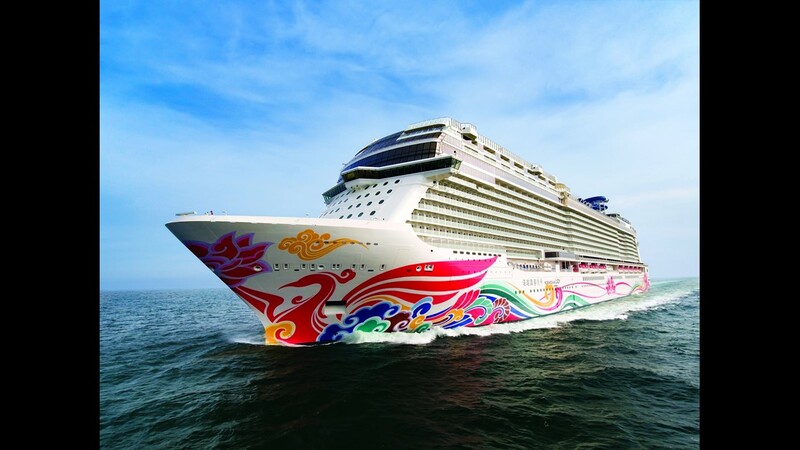 Norwegian Cruise Line's U.S.-flagged, Hawaii-based Pride of America has a stylized stars-and-stripes across its hull. You might say that Mediterranean ferry cruise company Moby Lines has gone "loony" with its hull designs. The hulls of the company's six cruise ferries and five fast cruise ferries feature Looney Tunes characters such as Bugs Bunny and Daffy Duck. Also playing with hull art, albeit in a fairly modest form, is start-up line Virgin Voyages. As seen in this artist's drawing, the company's first vessel (due in 2020) will have a giant mermaid with the Virgin flag on its hull. 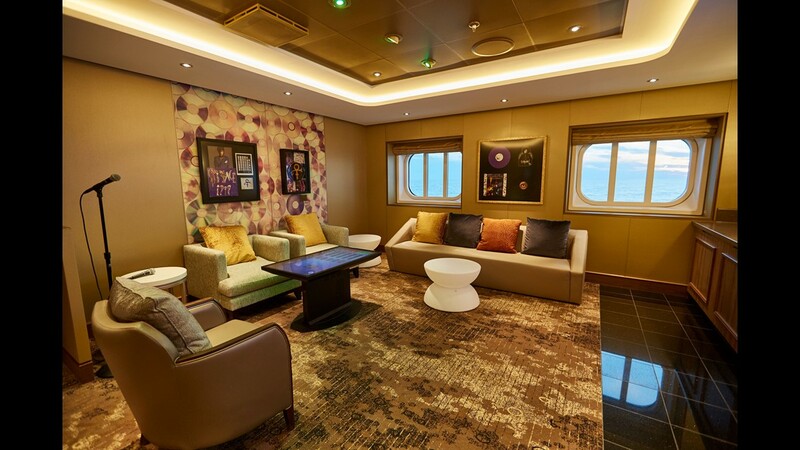 One major line that has eschewed the hull art trend is Carnival -- a surprise, perhaps, given the company is known for some of the most outrageous interior decor at sea. Carnival's ships feature an almost plain white hull design, with the only decoration being two modest red stripes. 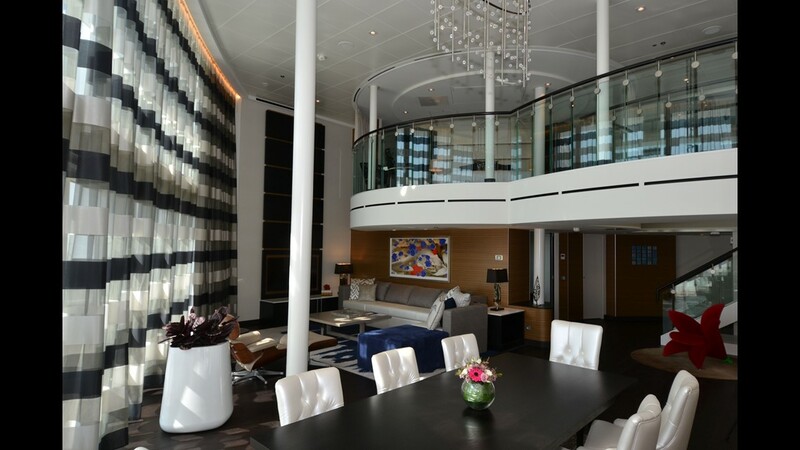 Also sticking with a minimalist look in hull design is Germany-based luxury line Hapag-Lloyd, which is known for some of the world's most upscale vessels. Here, the line's recently unveiled Europa 2, which features the line's signature blue-and-orange line along its hull. Another line that has taken a relatively minimalist approach to hull decoration is Royal Caribbean. 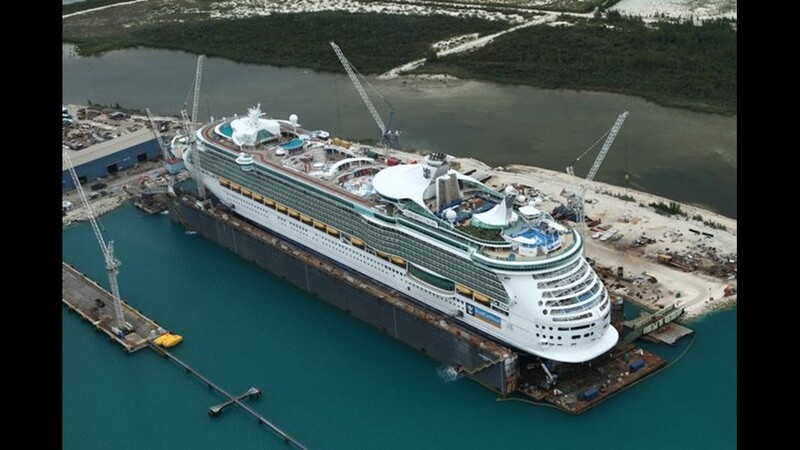 Over the past decade, Royal Caribbean has begun painting the lower part of its ship hulls a baby blue color that offers a tad of contrast with the white superstructure above. The baby blue color that Royal Caribbean has begun using on its ship hulls covers the portion of the vessels below the lifeboat deck. 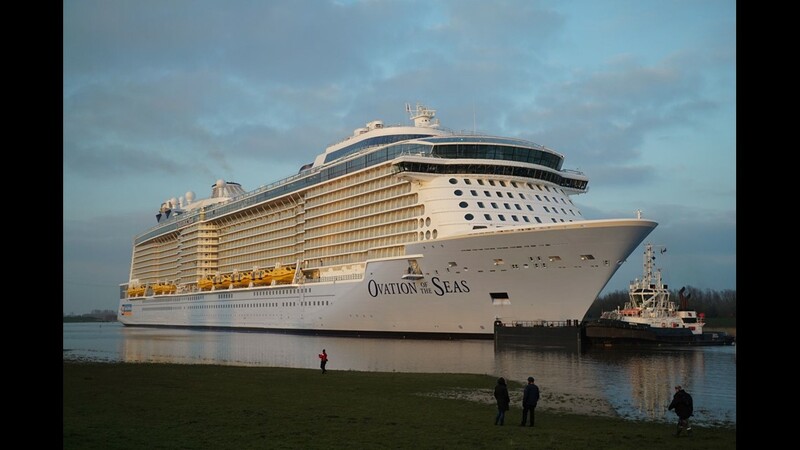 Here, the line's 2014-built Quantum of the Seas soon after it was first painted at a shipyard in Germany. At least one ship currently at sea has hull art that seems decidedly out of place, until you know the back story. The 2,004-passenger Norwegian Sky is adorned with Hawaiian leis, which don't seem to fit its current assignment sailing to Cuba out of Miami. The design dates back to the middle of the last decade, when the vessel sailed in Hawaii as the Pride of Aloha. 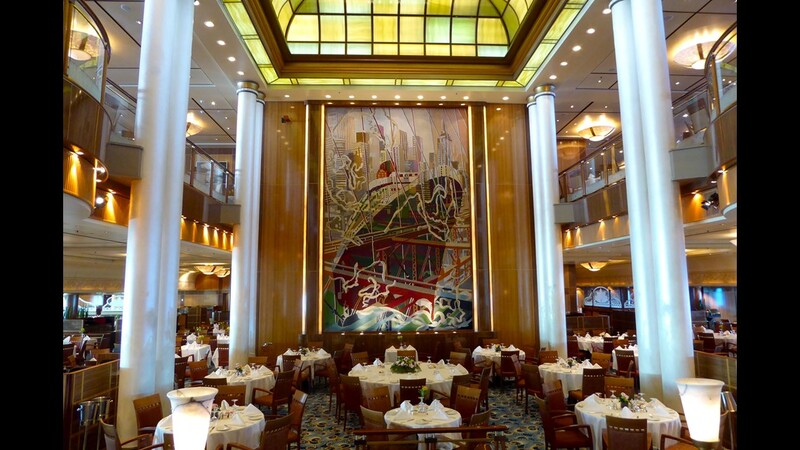 No other line has as many ships with elaborate hull art as Norwegian Cruise Line. 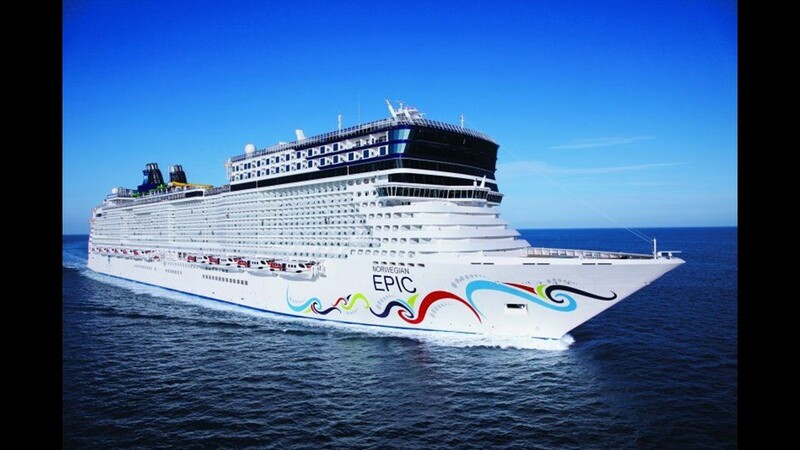 Here, the 2010-built Norwegian Epic, which features hull art designed by the line's in-house design team. It remains the only Norwegian ship whose hull art was designed in-house. The hull art on Norwegian Cruise Line's Norwegian Sun is notable in that it extends all the way up the side of the ship almost to the top deck. Playing off the ship's name, the design is of a stylized sun. 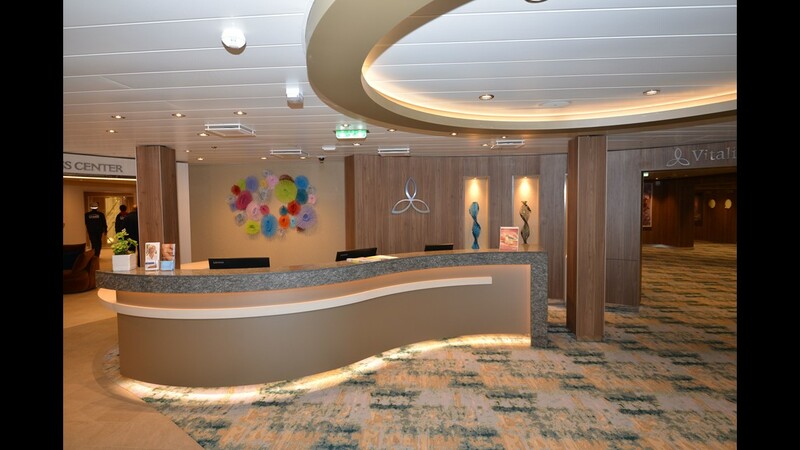 Norwegian Cruise Line's newest ship, the built-for-the-Chinese-market Norwegian Joy, features hull art designed to resonate in its assigned home ports of Shanghai and Beijing. Created by Chinese artist Tan Ping, it features a mythical red phoenix that has been found in Chinese art for centuries. Perhaps the most garish of Norwegian's hull designs (some might say) are the ones adorning the line's Jewel Class ships. 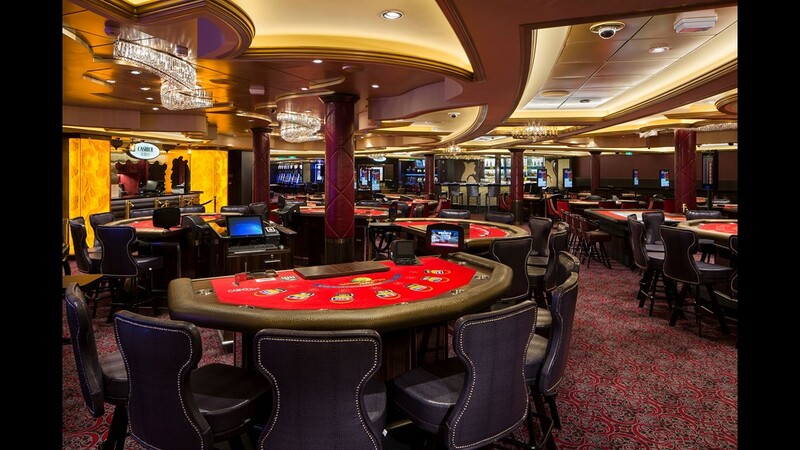 Here, the Norwegian Pearl, which features an undulating string of giant, jewel-toned pearls. Another artist who has created an art piece for a ship hull is Peter Max. He designed a giant artwork with New York motifs for Norwegian Cruise Line's 2013-built Norwegian Breakaway. The ship initially was based in New York. Seen from the front, Norwegian Breakaway's hull is awash in sky blue. Norwegian Cruise Line's next new ship, Norwegian Bliss, will feature images of marine mammals created by marine artist Wyland (shown here in an artist's drawing). Scheduled to debut in April, the ship will be deployed in Alaska during the summer. 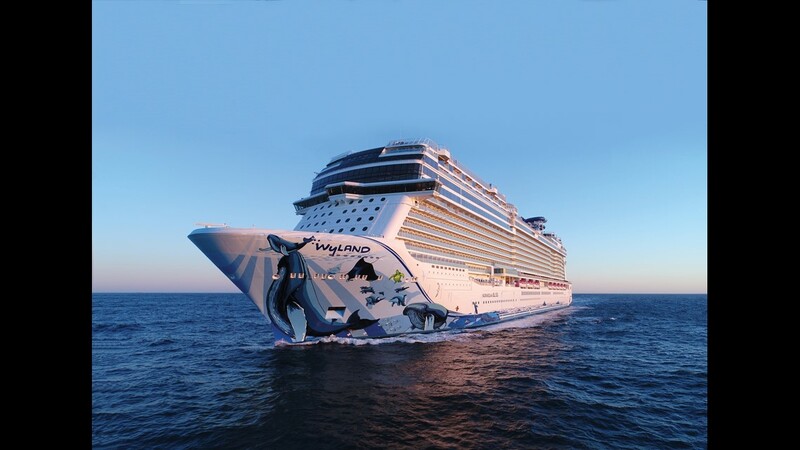 The public got its first glimpse of the Wyland-created hull art for Norwegian Bliss on Feb. 19, 2018 when the still-under-construction ship was floated out from a building dock at the Meyer Werft shipyard in Papenburg, Germany. What's next for hull art at Norwegian Cruise Line? The line has been mum so far on its plans for its next new ship, Norwegian Encore, due in 2019. Artist's drawings of the vessel released by the line show a blank canvas. Another look for cruise ship exteriors that remains popular is the combination of a darkly painted hull with a white superstructure. 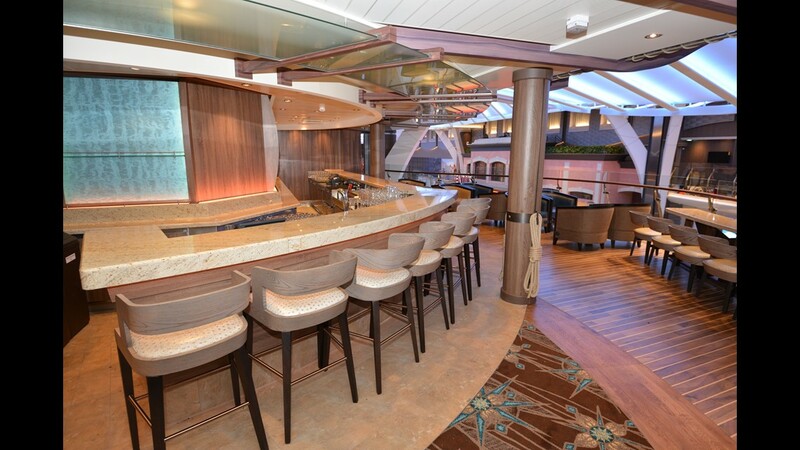 It's a traditional look that appeals to lines such as Holland America that are steeped in history. 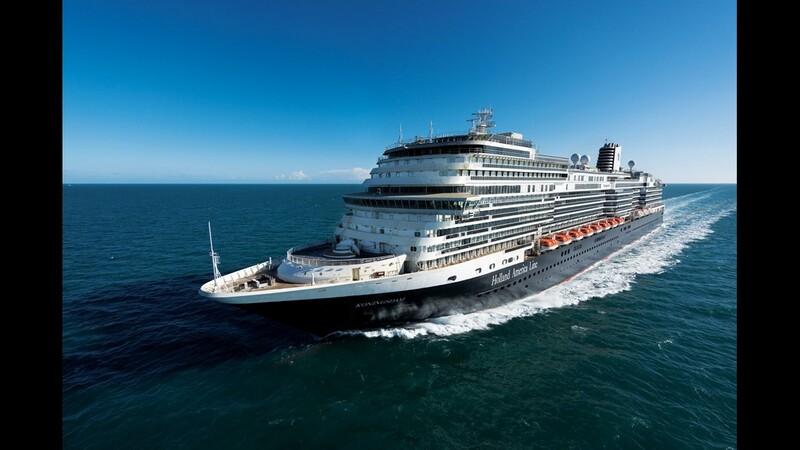 Here, Holland America's newest ship, the 2,650-passenger Koningsdam. The tradition of painting a hull a dark color is a throwback to the era of coal-powered steamship travel. Ship historians say passenger ships of the steamship era were outfitted with darkly colored hulls to hide the coal dust that would inevitably cover the areas where coal was loaded onto vessels. In addition to Holland America, lines that have stuck to darkly colored hulls to evoke vessels of old include Disney Cruise Line. Here, Disney's recently revamped Disney Wonder, which was designed to mimic the elegant lines of 20th century ocean liners. The dark hulls of Holland America and Disney ships evoke the similar look of such iconic ocean liners as Cunard's original Queen Mary. 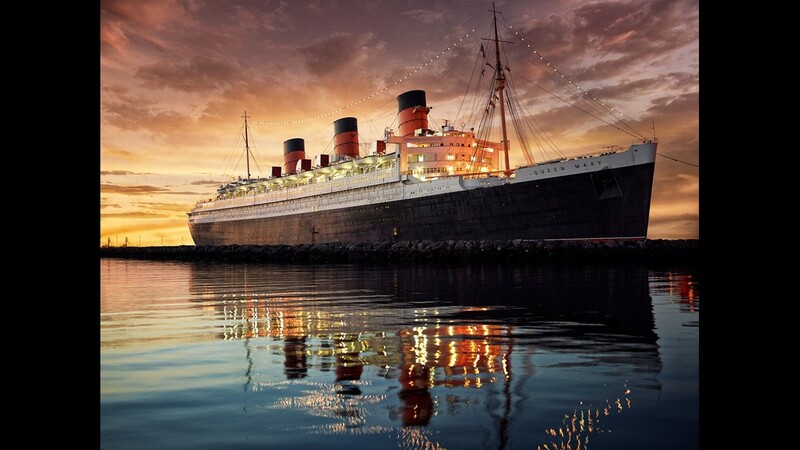 Built in the 1930s and long retired, it survives as a hotel and museum in Long Beach, Calif.
Cunard has continued the tradition of dark-hulled ships with its latest vessels. Here, the line's current flagship, Queen Mary 2. 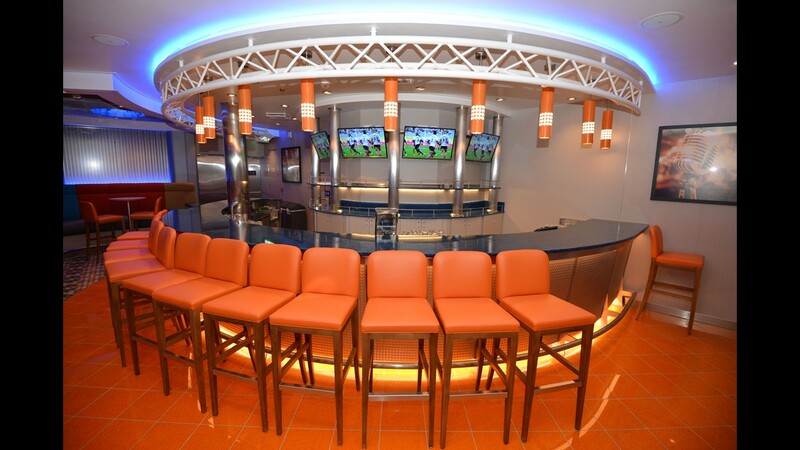 Another line that is going dark and solid with its hull decoration is Celebrity Cruises. 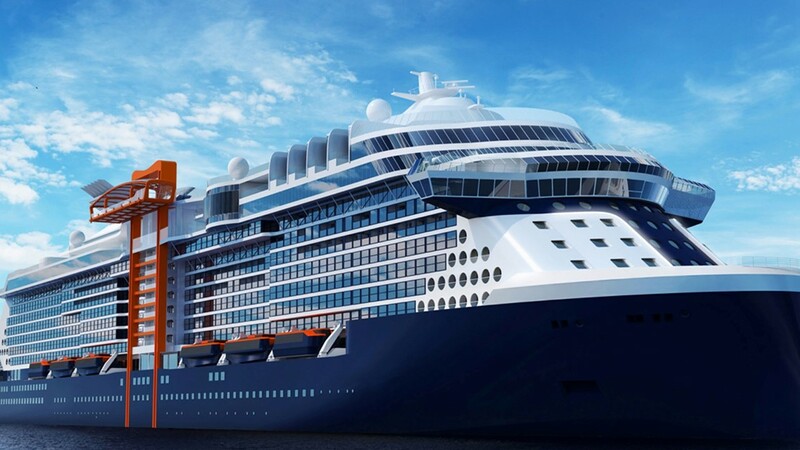 Here, an artist's drawing of the line's soon-to-debut Celebrity Edge, which will feature a dark blue hull. 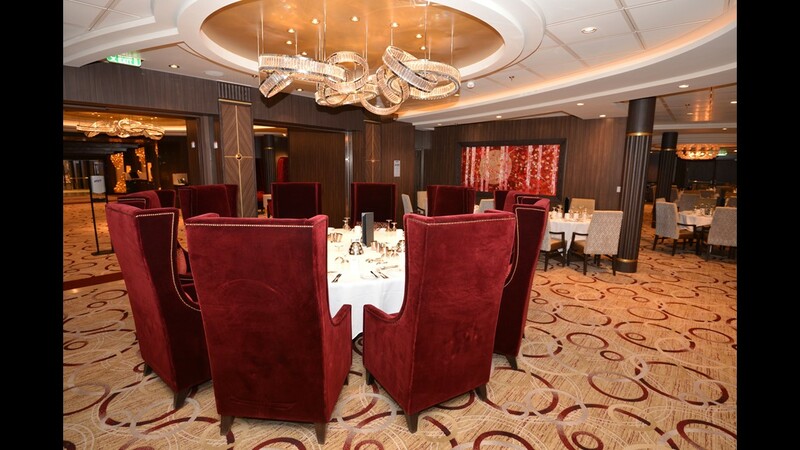 A twist on the tradition of darkly colored hulls is the new look for ships in the fleet of British line Marella Cruises, which until October was called Thompson Cruises. The hull decoration for the line's ships now features a mix of solid dark blue and baby blue colors that swirl along the side of the vessels. 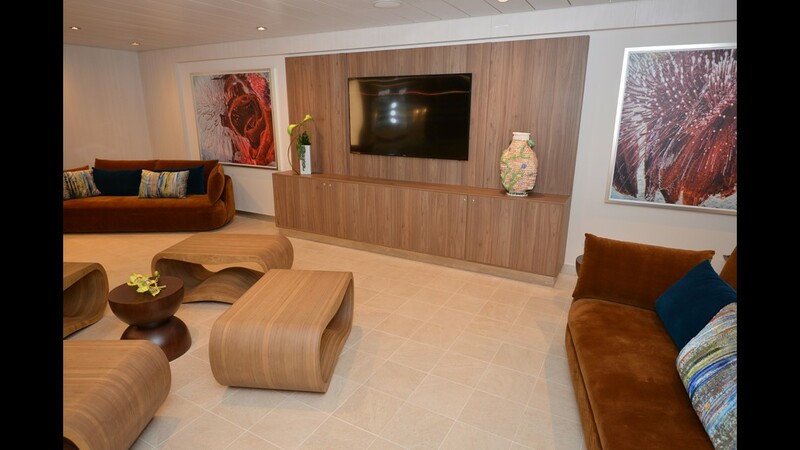 One segment of the cruise world that hasn't jumped on the hull art trend is the luxury segment. 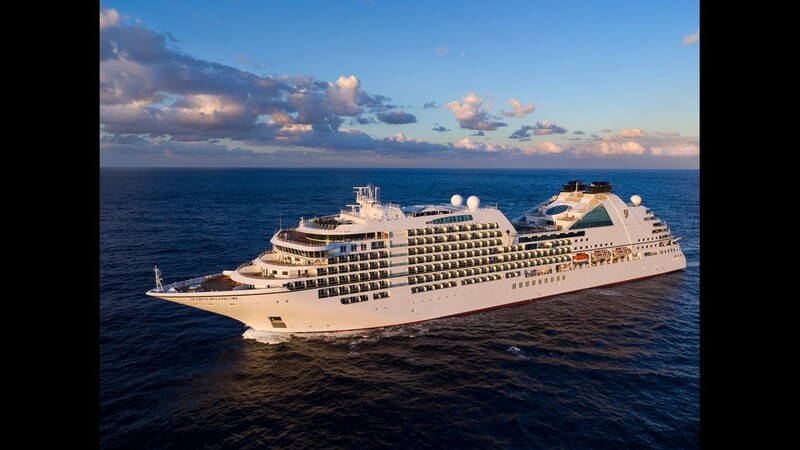 Many luxury lines such as Seabourn Cruise Line go with a clean white look for their ship exteriors. 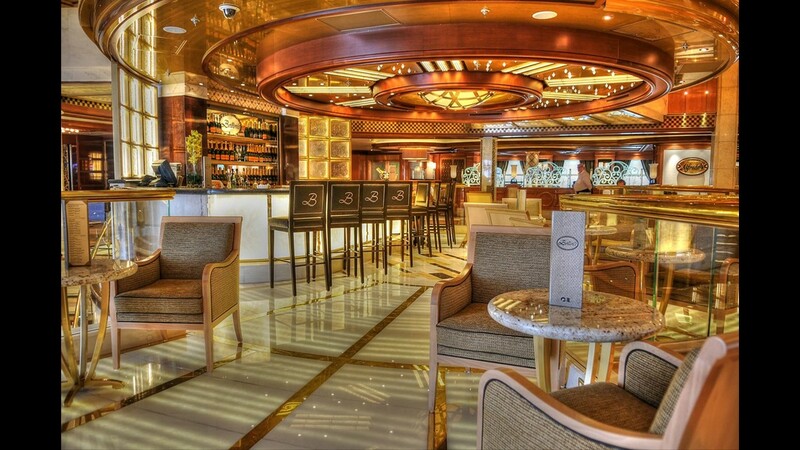 Here, Seabourn's new Seabourn Encore. 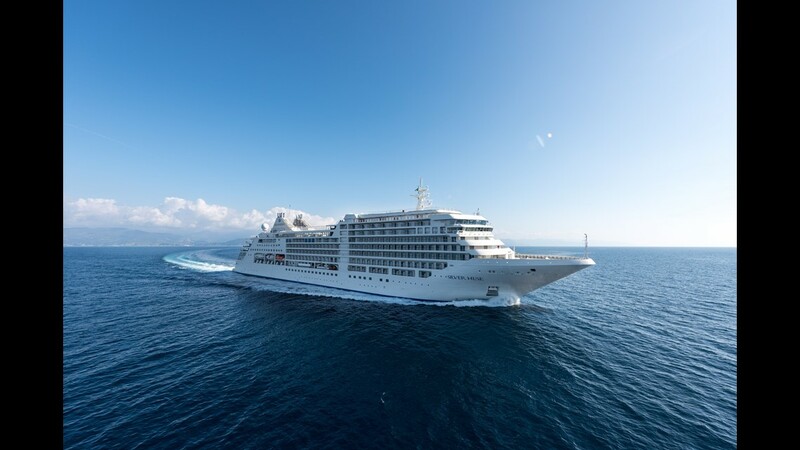 Luxury line Silversea Cruises also favors an all-white exterior for its ships (with the exception of its small expedition vessels). Here, the line's new Silver Muse. Even some river cruise lines have jumped on the hull art trend. Here, a vessel operated by German line A-Rosa on the Danube River that features a large painted rose on its hull. Like Germany's Aida Cruises, A-Rosa also has splashed big red lips on the bow of it ships. The lips appear to hold the line's signature rose. While the ships operated by market leader Viking River Cruises don't feature hull art, they do have two openings at their front that makes them look like they have eyes. One place you won't find hull art is on the gingerbread-like riverboats of the American Queen Steamboat Co. Maybe the vessels themselves are art enough.